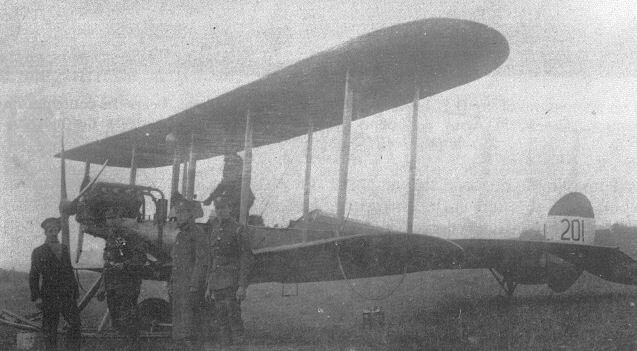 The prototype B.E.12. 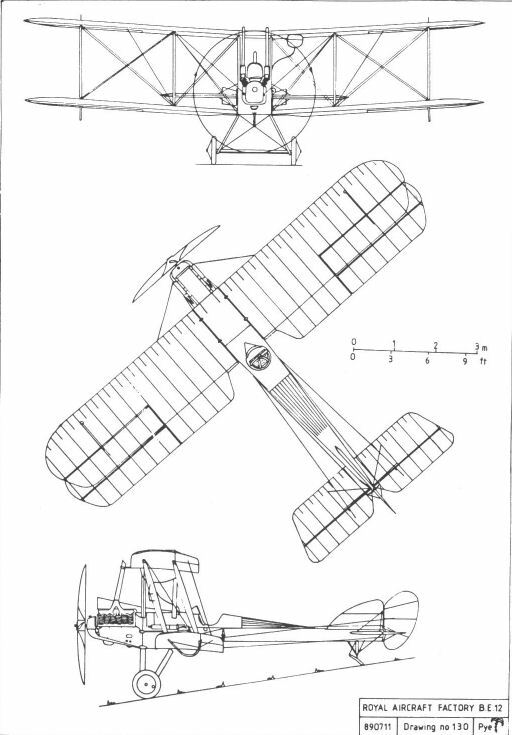 Note the tandem air scoops to cool its R.A.F.4a engine, and the complex exhaust system. Production B.E.12 6478. Its fin appears to be an in-service replacement, and has yet to have the machine's serial number painted on it. BE.12 с синхронным пулеметом "Виккерс"
B.E.12 6536. 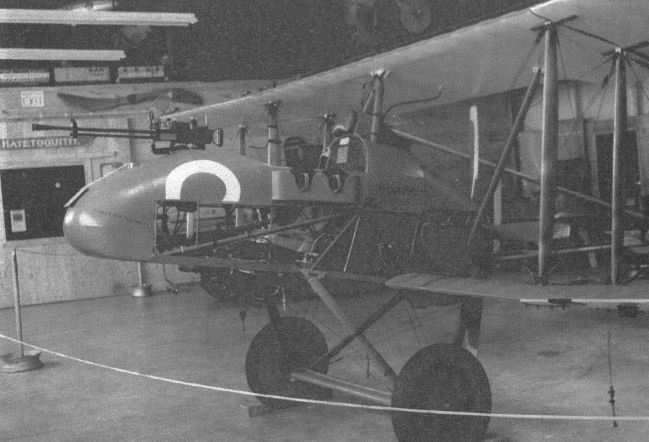 Note the Vickers gun mounted on the fuselage side, and the long operating rod for the Vickers-Challenger interrupter gear. A B.E. 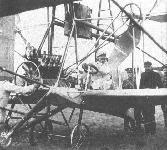 12b with its ground crew. Note the bomb racks under the wings and fuselage. The occasion which prompted this impressive line-up of Factory designs is unfortunately not recorded, nor is the purpose of the marquee behind them, but the types present suggest a date of mid-1916. 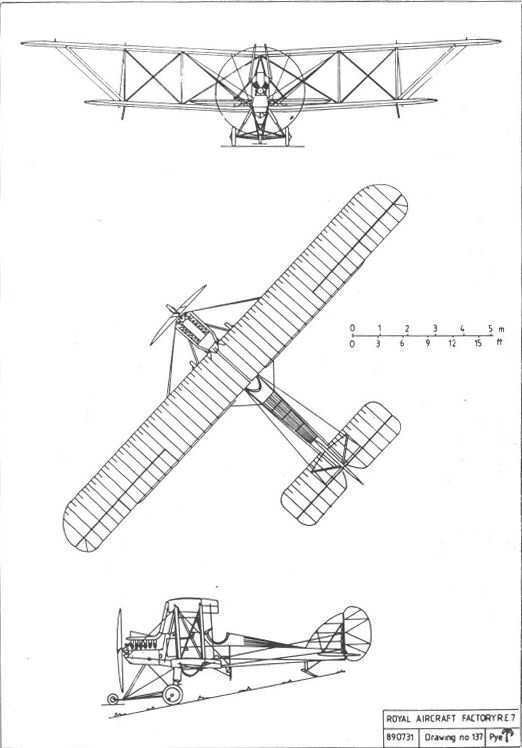 Left to right, the aircraft are: B.E.2c, B.E.2c, B.E.2b. 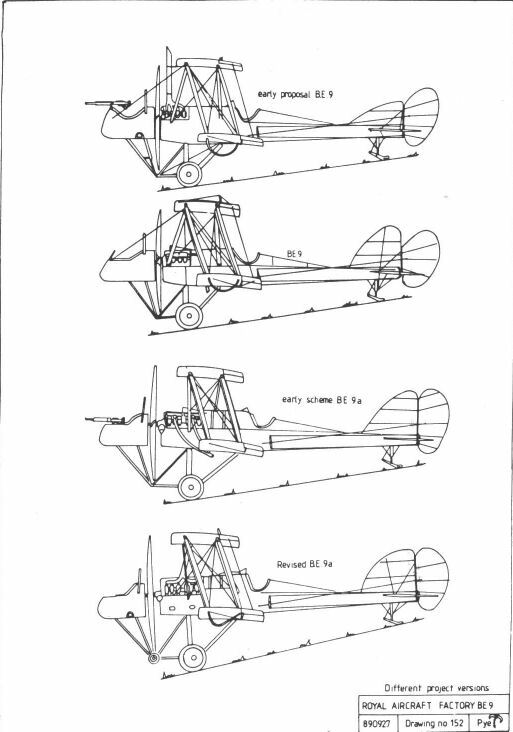 B.E.12, Hispano-Suiza-powered B.E.2c, F.E.8, S.E.4a, F.E.2c, F.E.2b, R.E.8, R.E.8, and R.E.7. 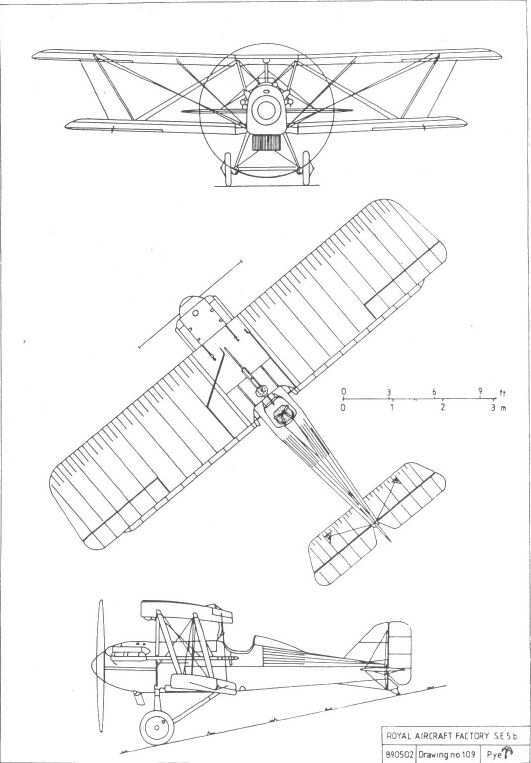 RAF FE.2a was a much enlarged aircraft developed in 1914. The prototype flew with a Green engine but the small number of production aircraft used the Beardmore. 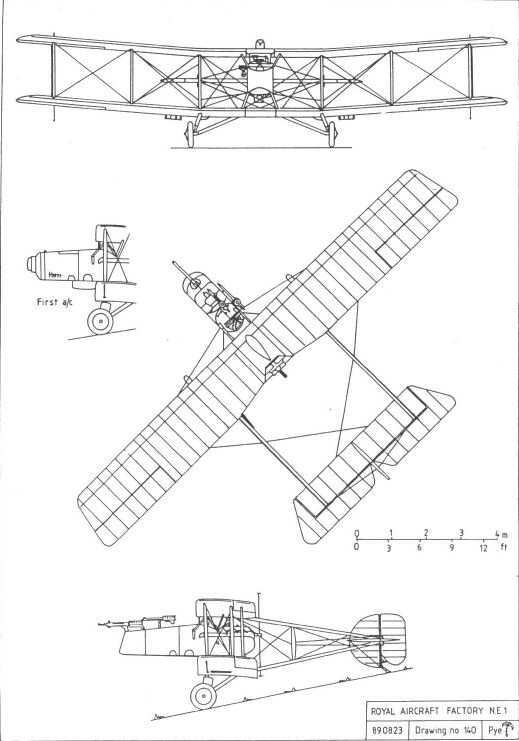 An early production F.E.2B, No 4962, probably built at the parent Factory with 120hp Beardmore engine and the cumbersome oleo undercarriage with nose wheel. 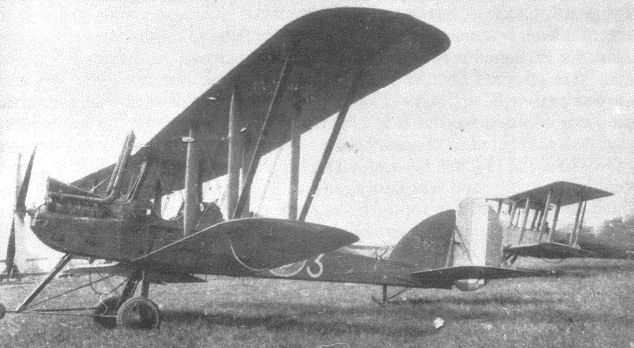 A single-seat F.E.2b, 9124, of 51 Squadron RFC, some time in 1918. The two small circular apertures in the nose are for the muzzles of its two Lewis guns. 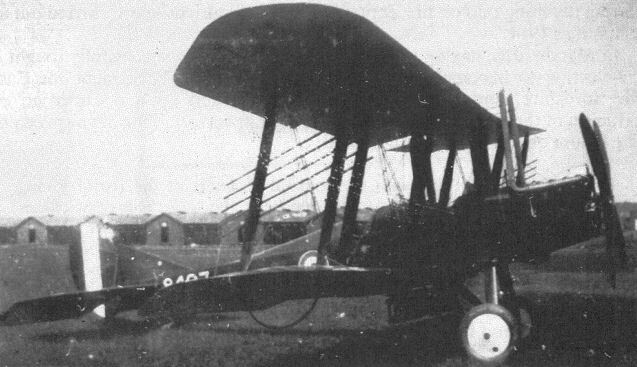 F.E.2b A781 fitted with a small searchlight coupled to two Lewis guns. Presentation F.E.2b A5481, Gold Coast No 13, fitted with a vee undercarriage. A pillar mounting for the Lewis gun can be seen to the rear of the observer's cockpit. Flotation trials of F.E.2b 6536 at the Isle of Grain. 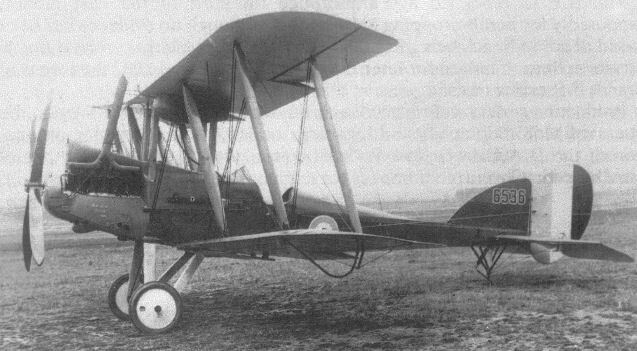 F.E.2b B401 equipped for experiments in flying into balloon cables. Note the outriggers from the outermost interplane struts, carrying the fender wire to the bowsprit in the nose. 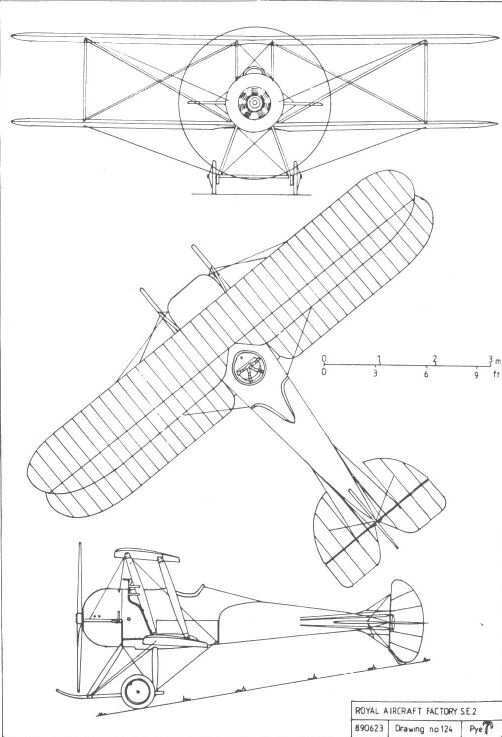 An F.E.2d, showing the unshuttered radiator. The airship sheds in the background were, at that time, the home of the Southern Aeroplane Repair Depot. 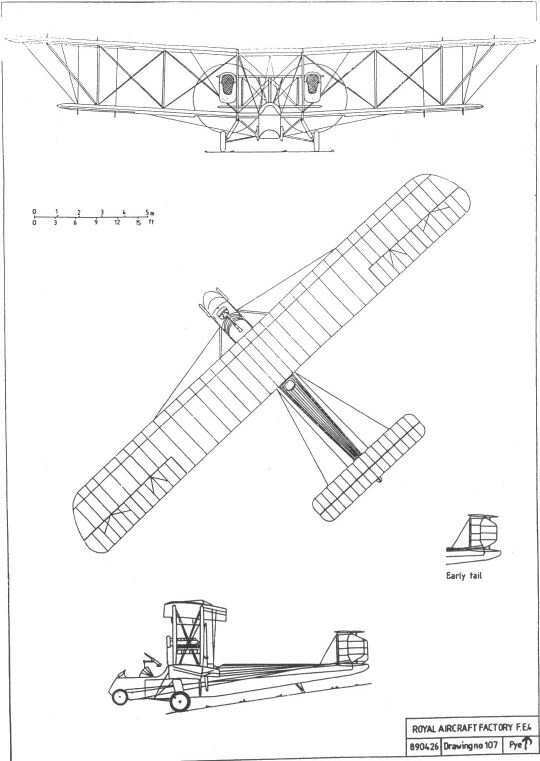 An F.E.2d with the Trafford Jones modification to its oleo undercarriage. 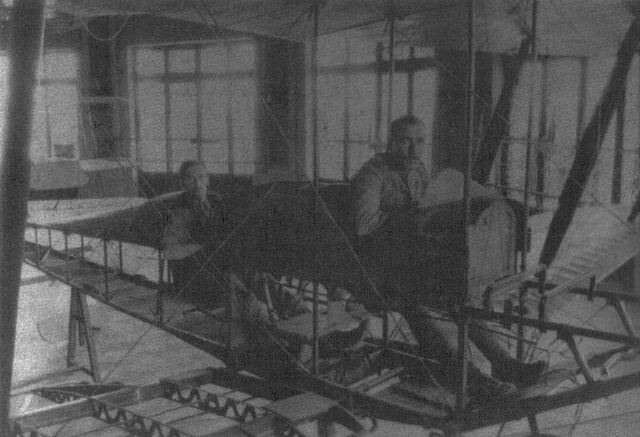 The cockpits of an F.E.2b. The observer's Lewis gun is attached to the front pillar mounting, and alternative mountings are provided immediately in front of the pilot's windscreen and to each side of the nacelle, that on the port side having a fixing clamp already attached. 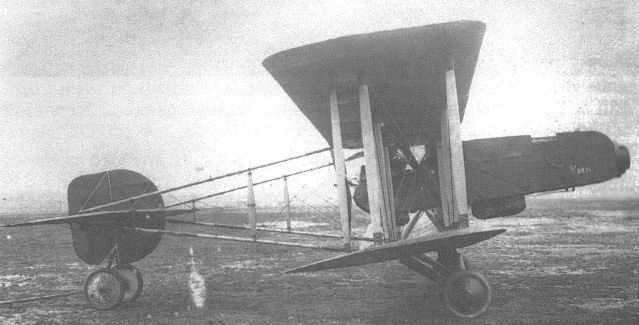 The first prototype F.E.8, showing the original gun installation. The location is not known, but the aeroplanes faintly discernible in the background are B.E.2cs. An unidentified production F.E.8 on Farnborough Common, with the Factory buildings in the background. A replica F.E.8 on display at the Owl's Head Museum of Transportation, Maine, USA. The replica F.E.8 built and flown by Cole Palen at Old Rhinebeck Aerodrome, New York, USA. 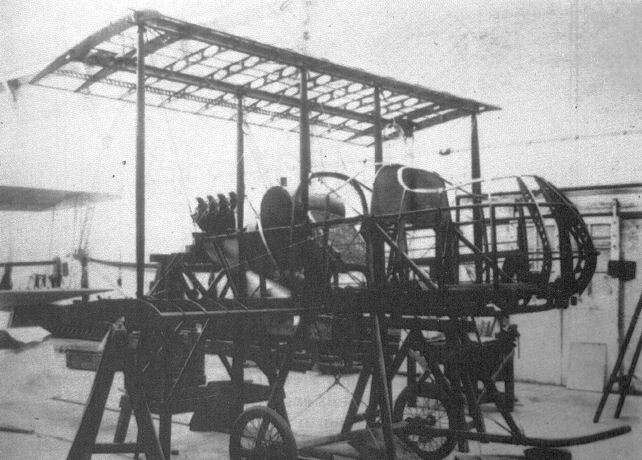 The first production S.E.5 with its Aldis optical gunsight fitted through its 'greenhouse' windscreen. An early S.E.5 with the 'greenhouse' windscreen and overwing gravity tank. 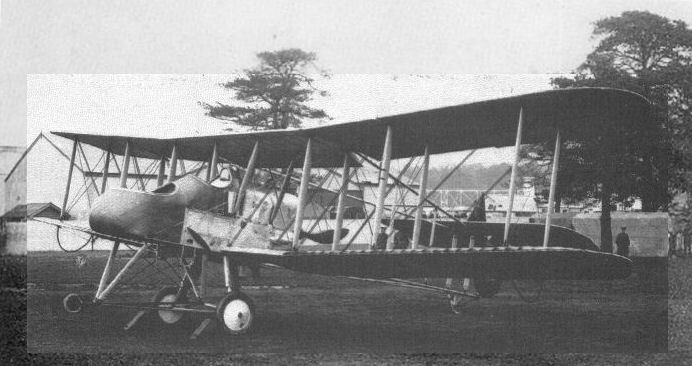 A Farnborough-built, early-production S.E.5 for service with No 56 Sqn in 1917. S.E.5 A4853 displays its 'Avro' pattern windscreen and the unusually long taper to its head fairing. This machine is most probably A4864, and was originally built as an S.E.5. It has the low thrust line of the ungeared engine, but the long exhaust pipes and all-wood undercarriage of later examples. The curved headrest is unusual. 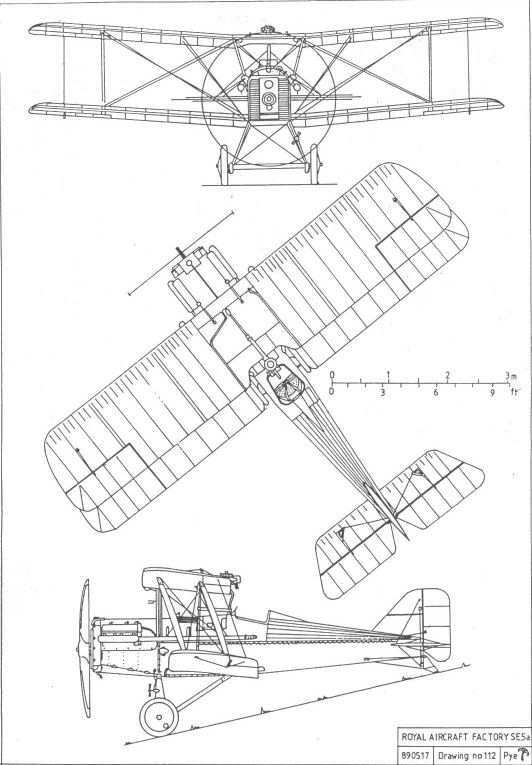 Albert Ball shows the high seating position of the early S.E.5s in A8907, which also has the 'greenhouse' windscreen and over-wing gravity tank. Unarmed S.E.5 A8917 fitted with an internal gravity tank and the early 'greenhouse' windscreen. Designed around the Hispano-Suiza V-8 engine; the Factory's pugnacious S.E.5. 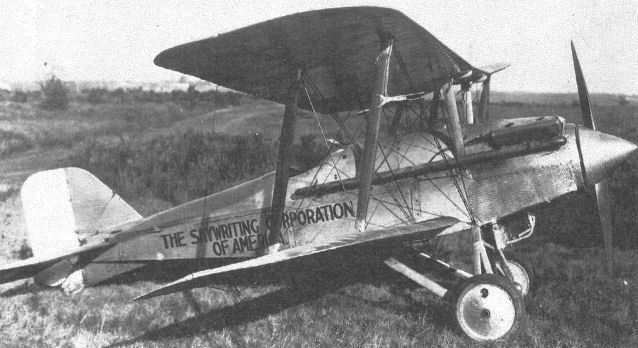 An unidentified S.E.5a with the early form of undercarriage. 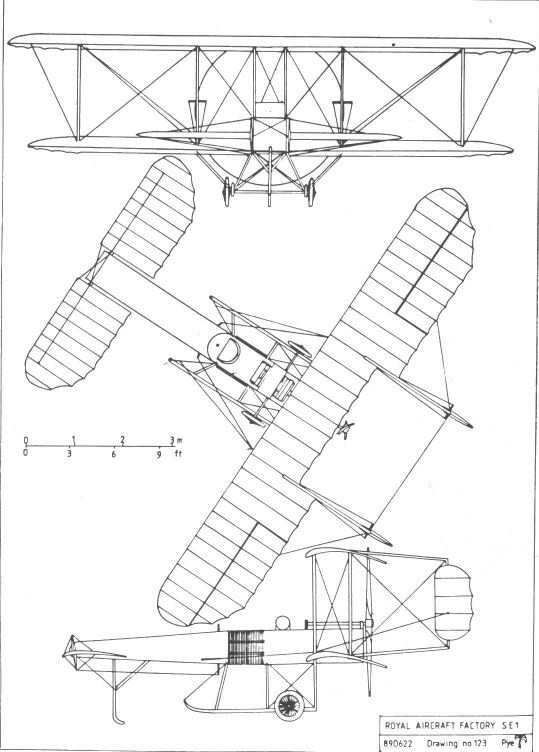 Note the higher thrust line of the geared engine, which necessitated a modified Foster mounting to prevent the bullets from its over-wing Lewis gun striking the propeller. 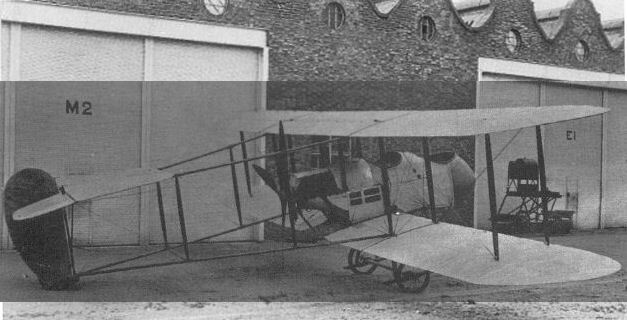 A standard production S.E.5a with a geared 200hp Hispano-Suiza engine. A fine air-to-air study of the Shuttleworth Collection's S.E.5a, G-EBIA/F904, taken on April 11, 1977, shortly after its first flight following the replacement of the geared 200hp Hispano-Suiza engine by a direct-drive 200hp Wolseley Viper. This original S.E.5a is now part of the Shuttleworth Collection at Old Warden Aerodrome, Bedfordshire, England, where it performs regularly in flying displays. An unidentified S.E.5a fitted with an experimental low-aspect-ratio fin and rudder of remarkably Teutonic appearance. The handle of the starting magneto is visible just below the exhaust pipe, where it could be operated either by the pilot or by a mechanic standing alongside. S.E.5a G-EBCA (ex-E5956) fitted with an 80hp air-cooled Renault engine in private ownership. Its maximum speed thus powered is believed to have been about 65mph. A postwar skywriting modification of S.E.5a G-EBGL (ex-F7960). 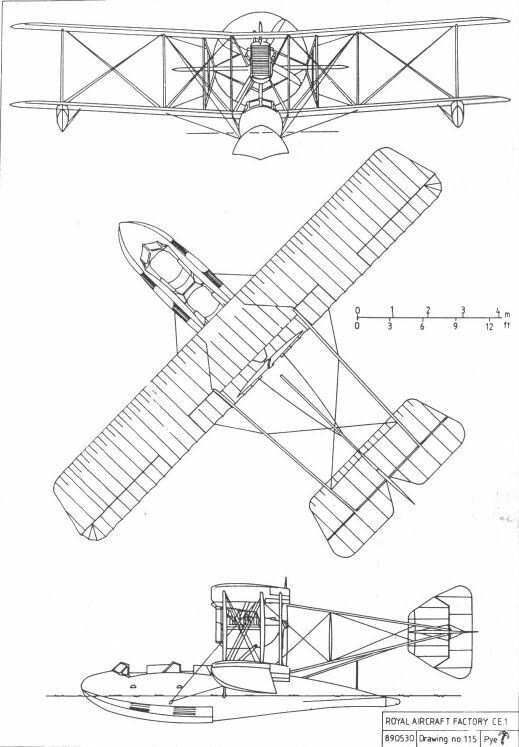 Later skywriters had their exhausts extended beyond the tail, the rudder being divided to accommodate them. 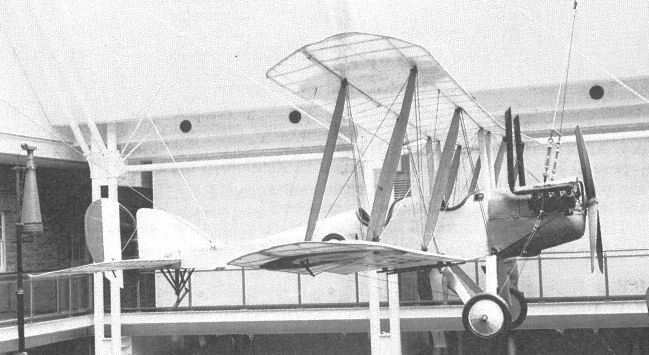 Eberhart-assembled S.E.5a (or S.E.5E) 22-325, photographed in the USA in 1926. 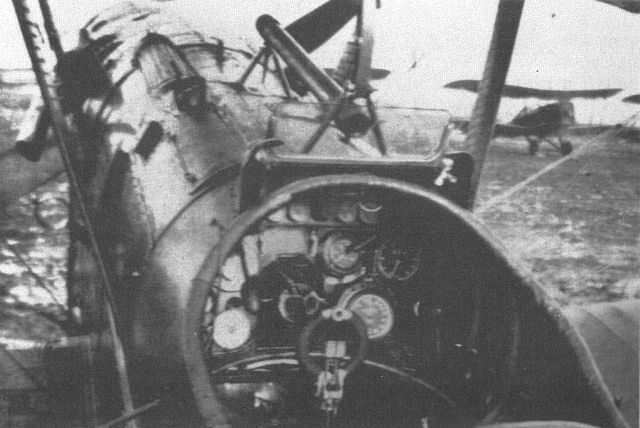 An S.E.5a cockpit, showing the Aldis optical gunsight directly in front of the pilot, and the Vickers gun offset to port. The exhaust pipes have been shortened, leaving a redundant support bracket on the fuselage side below the Vickers gun. 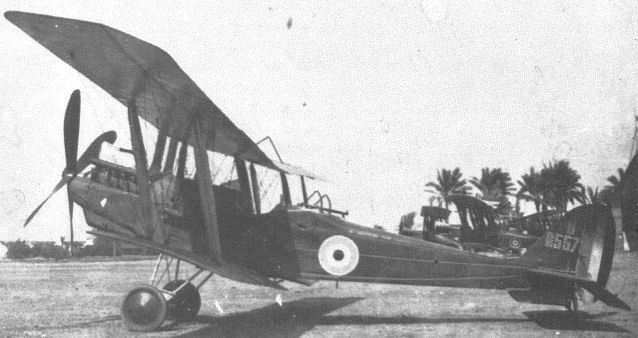 Rival British fighters, the Sopwith Camel (foto) and the Factory's S.E.5a. Together they finally wrested aerial supremacy from the Germans. 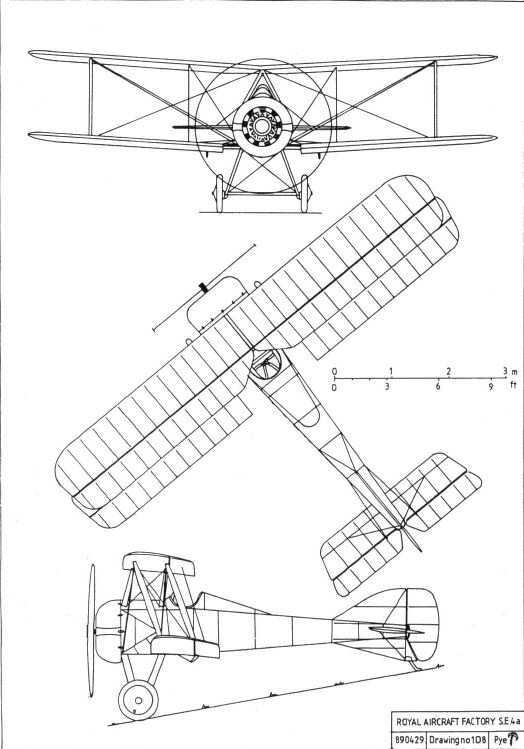 The cause of the 'Fokker Scourge'. A Fokker Eindecker with the German 'Ace' Oswald Boelke in the cockpit. The forward-firing machine gun which made it such a feared adversary is clearly visible. R.E.7 2423 at South Carlton. The aircraft behind the rudder is a D.H.6. R.E.7 2427 in service as a target tug. 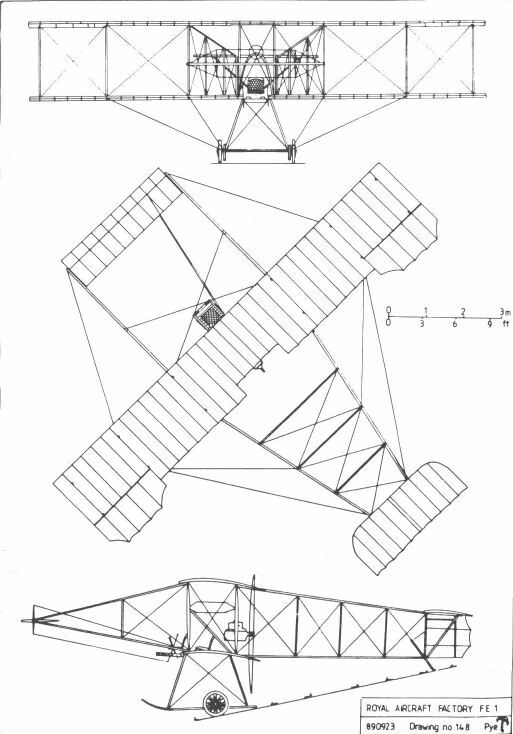 The actual target, a crude drawing of an aeroplane fuselage, can be seen behind the port outer interplane struts. 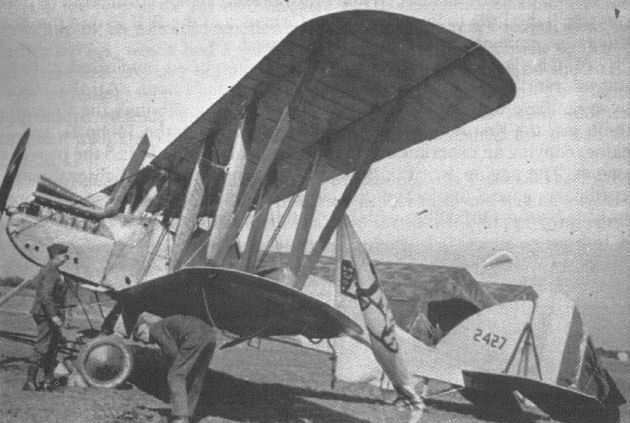 An unidentified R.E.7, showing the installation of its R.A.F.4a engine. 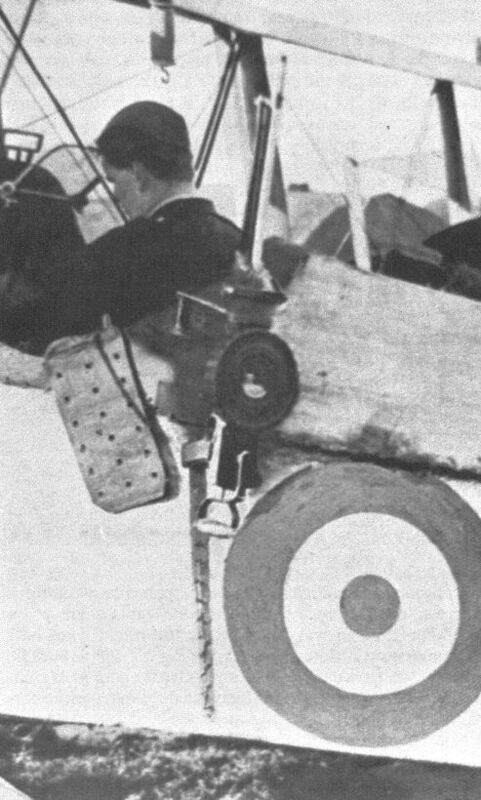 Note the hinged airbrakes beside the forward cockpit. An R.E.7 fitted with a 225hp Sunbeam Maori engine in an elaborate cowling. 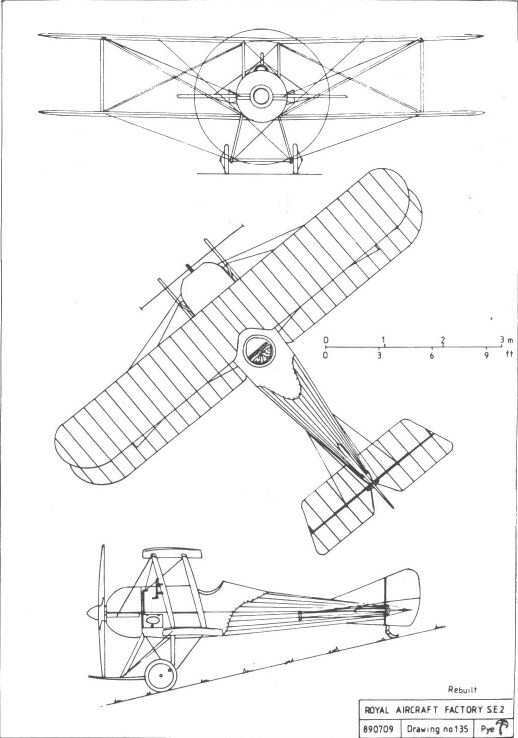 The original B.E.2 as it first appeared. 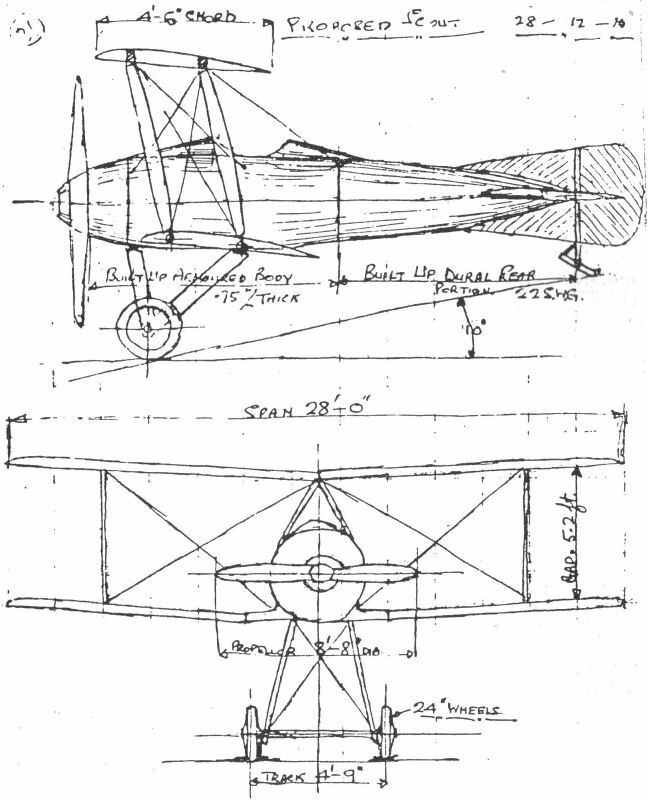 Note how the exhaust pipes pass within the fuselage, giving a small reduction in head resistance. 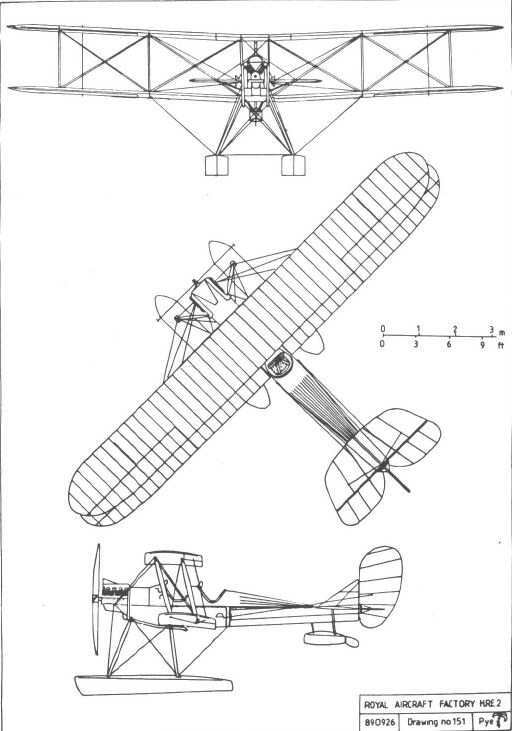 The original B.E.2 modified to include decking between the cockpits. The exhaust pipes are now fully external, whereas they had initially passed through the fuselage. The pilot is Geoffrey de Havilland. Note that the undercarriage skids are shorter than those of the B.E.I. 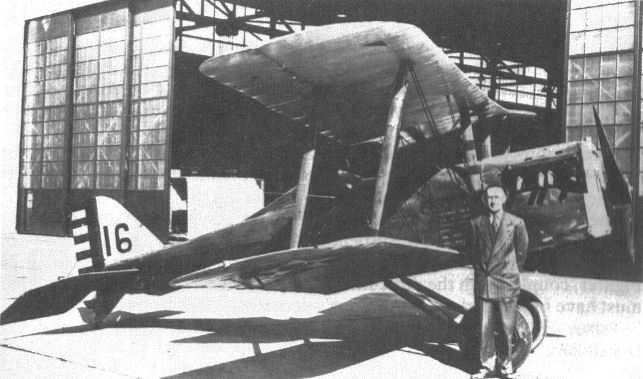 Geoffrey de Havilland in a B.E.2 outside the RFC hangars which later became famous as the 'Black Sheds'. B.E.5 number 205 at Montrose, after the engine change which brought it to B.E.2 configuration. B.E.6 number 206 soon came to be regarded as a B.E.2 which, in effect, is what it always was. An assortment of Royal Aircraft Factory designs in front of the RFC sheds on Farnborough Common. Aircraft 206 was built as B.E.6, 239 and 329 are B.E.2as, and behind them is the R.E.I. 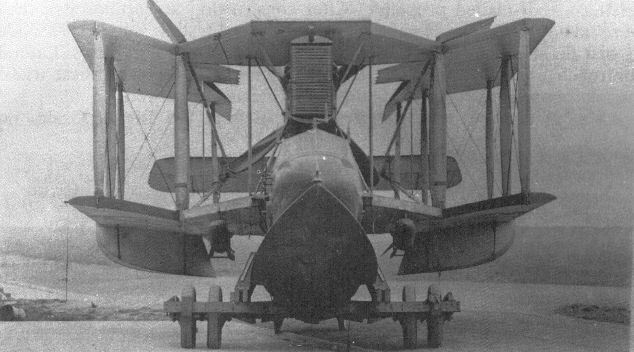 A Farnborough-built B.E.2a, showing the decking behind the engine introduced on this model. 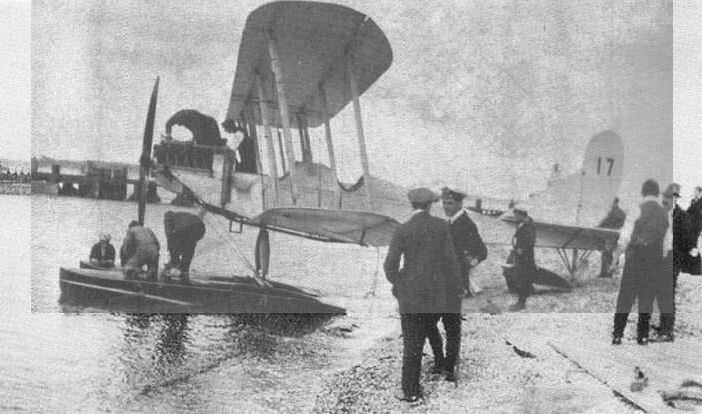 B.E.2a 225 photographed after crossing from Ireland on 26 September 1913. 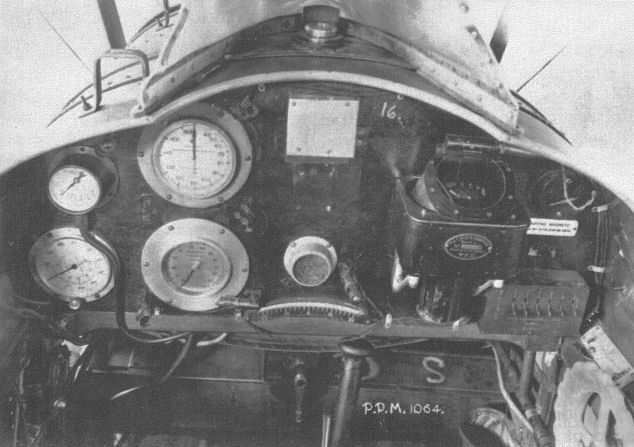 The simple instrument panel, which contained a revolution counter, an airspeed indicator, an altimeter, and a watch, was combined into a single unit manufactured by Elliot Brothers. 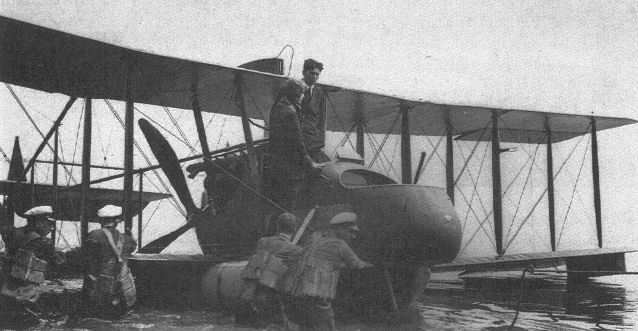 B.E.2as of 2 Squadron RFC fitted with flotation bags in case of a need to ditch during their flight across the Irish Sea. 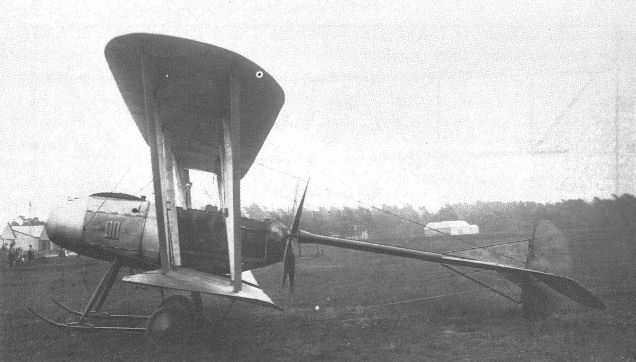 B.E.2a 331 at the edge of Farnborough Common, with the Balloon Shed in the background, 10 February 1914. 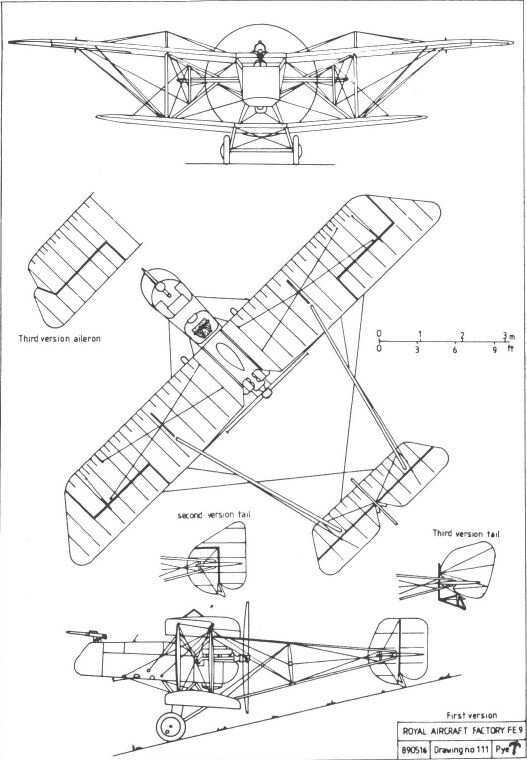 This machine crashed en route to Netheravon on 15 May 1914. 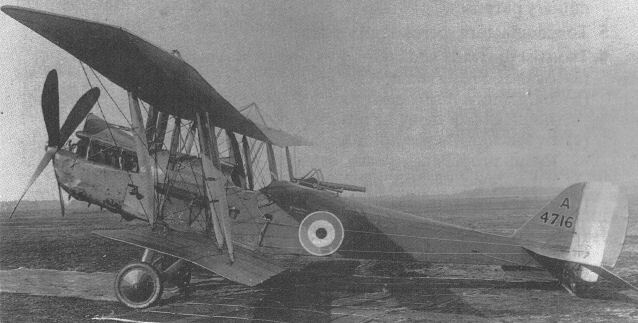 An immaculate Vickers-built B.E.2a. The purpose of the box-like structure in the pilot's cockpit is not known. This view across Farnborough Common towards the Factory site was taken during 1913-14. 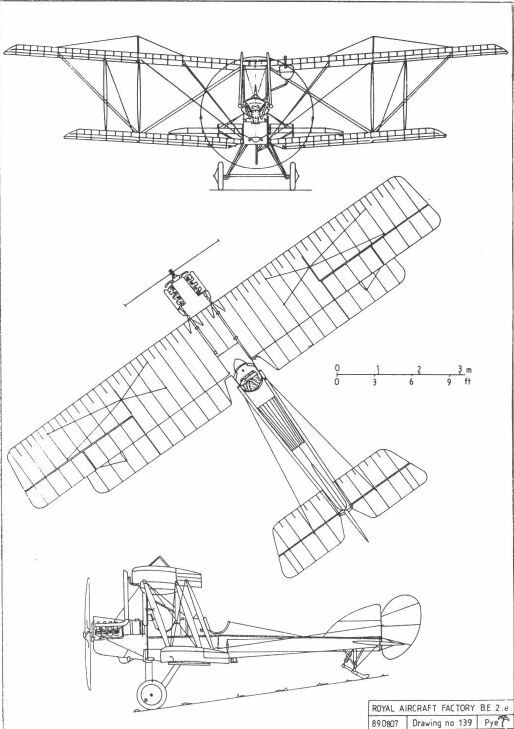 The B.E.2 flying overhead was added in the photographer's studio. 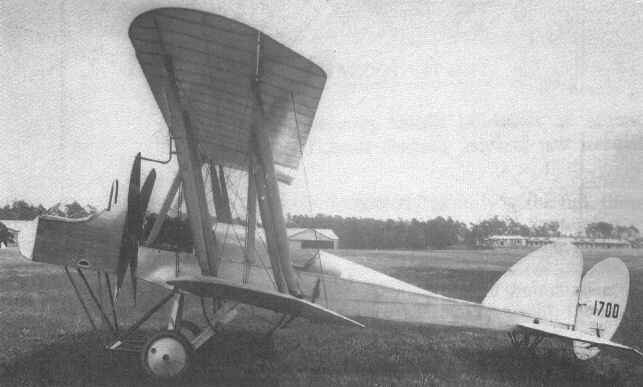 A B.E.2a at Point Cook, Australia, in 1914. The pilot is Lt Williams (later Air Vice Marshal Sir Richard Williams). 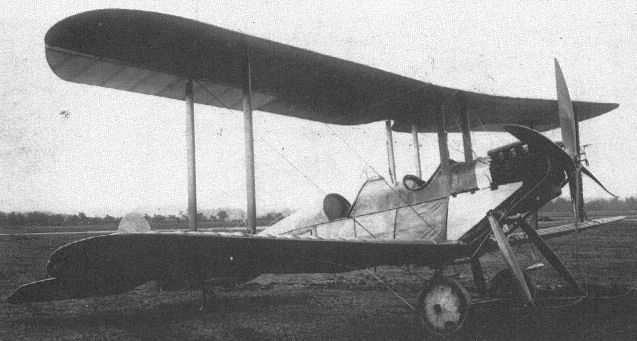 A B.E.2a fitted with experimental interplane struts designed to provide additional fin area. 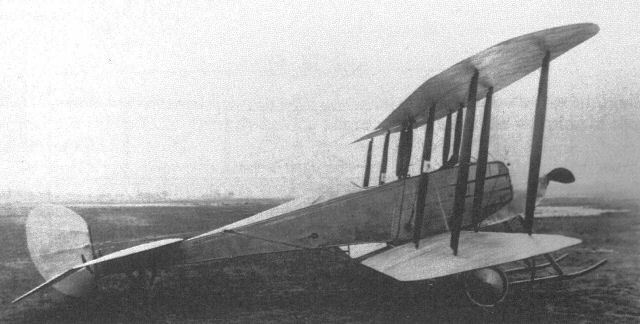 A B.E.2a fitted with an experimental oleo undercarriage. It also has the 'fin struts' whose increased area can be seen at their upper ends. 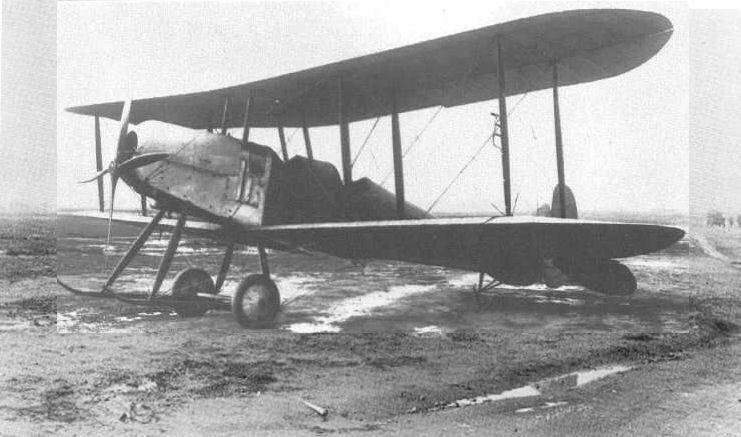 A B.E.2a with an experimental two-bladed propeller. Its wing structure is clearly visible through the translucent clear-doped fabric. The office block, Balloon Shed and new airship sheds are in the background. 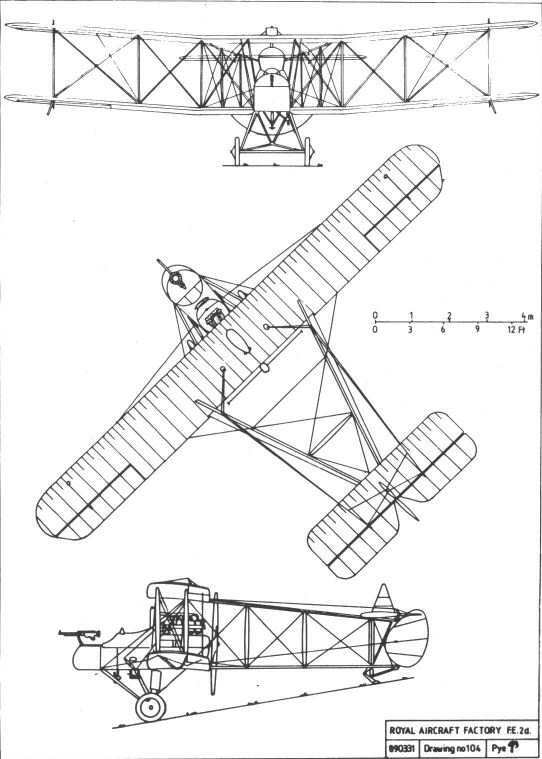 A B.E.2b, showing the reduced size of the cockpit cut-outs which gave improved weather protection, and control surfaces but initially used warping for lateral control. This particular example appears to have been rigged without dihedral. 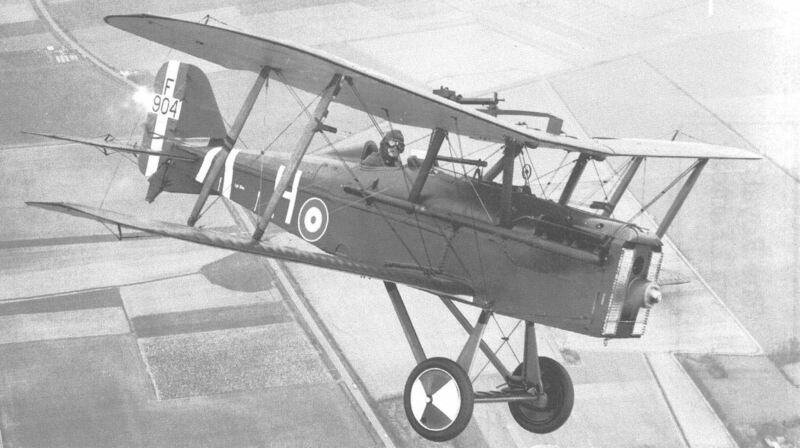 This B.E.2b, 2781, was one of a batch built by Jonques, some of which may have been completed as B.E.2cs. 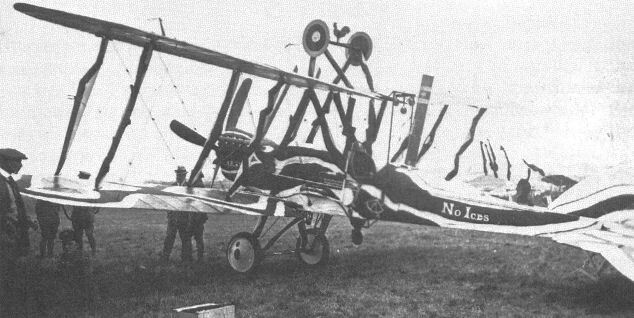 Early B.E.2c 1145 (70hp Renault) after a mishap at RNAS Redcar in October 1916. Note the bomb rack under the sump and the unusual fin marking. 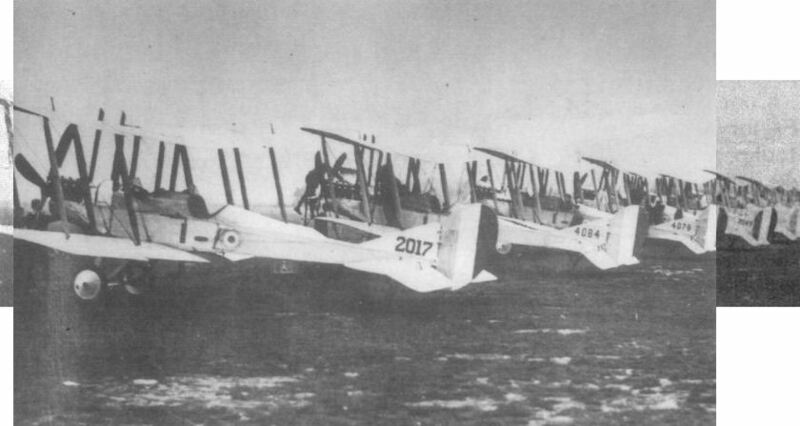 B.E.2cs of 13 Squadron at Gosport on 12 October 1915, en route for France. Aircraft 2017 was built by Armstrong Whitworth, 4084 and 4079 by the British and Colonial Aeroplane Company, and 2045 by Daimler. The difference in serial styles is noteworthy. The BE2c Squadrons proved invaluable in the early months of the war, providing timely reconnaissance to the commanders on the ground. 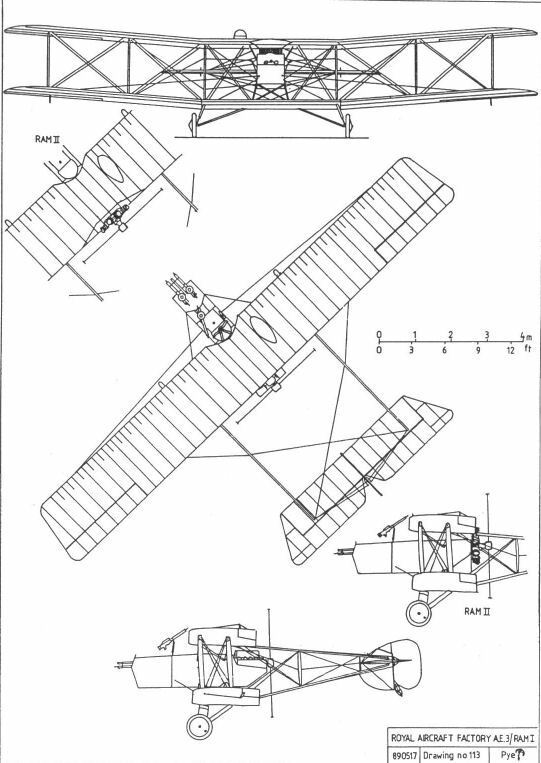 Furthermore, it was not long before they were showing their value in co-operating with the artillery on spotting fall of shot: this particular role, in which the RFC squadrons became particularly adept, grew in importance as the land battle became more static. 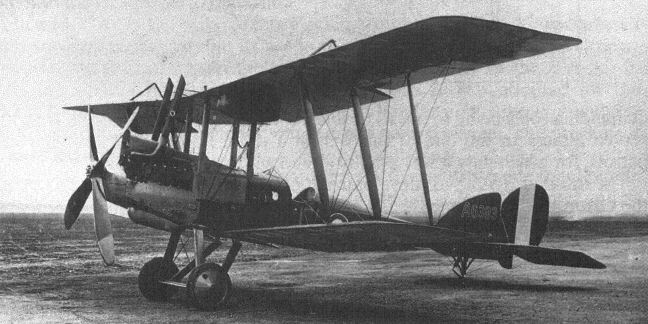 A later B.E.2c, with an R.A.F.la engine and the vee undercarriage. This particular machine, 2687, was built by Ruston, Proctor, and is fitted with underwing bomb racks. The beautifully restored B.E.2c 2699 on display at the Imperial War Museum, London. A beautifully finished Renault-powered B.E.2c, the first of a batch built by Wolseley Motors. 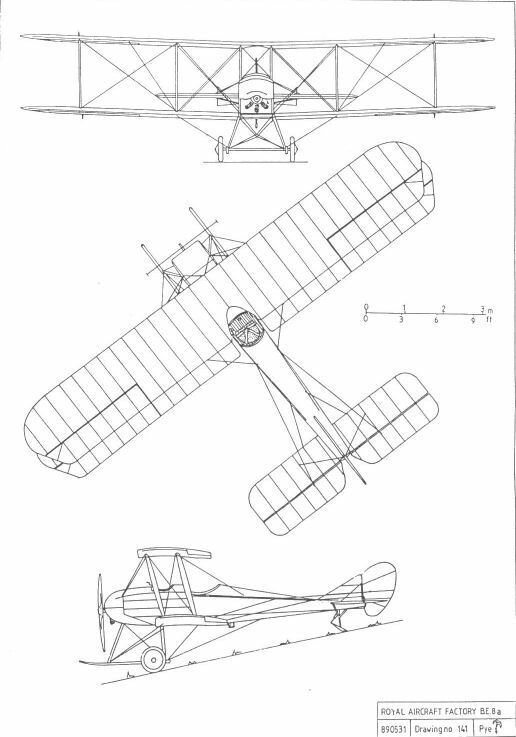 A production B.E.2c built by Hewlett and Blondeau, one of twenty or so contractors who undertook its manufacture. 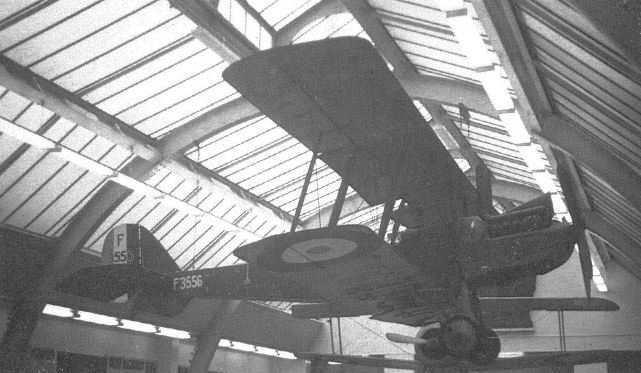 Blackburn-built B.E.2c 9969 on display at the Musee de L'Air, Paris, France, in 1980. 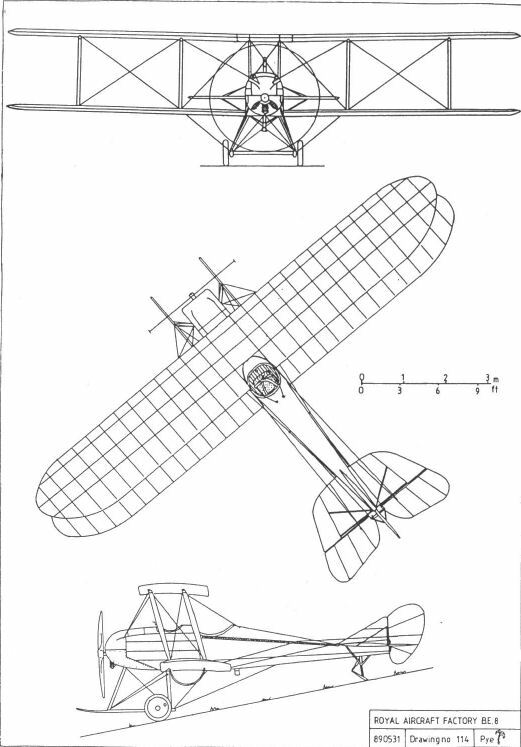 The sump cowling and wheel covers are missing, and the fin is of the later B.E.2e pattern, a modification frequently carried out in service. 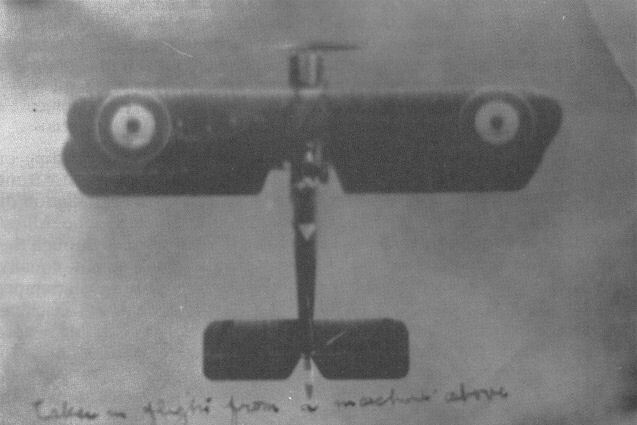 An unidentified B.E.2c photographed from a machine flying above it. Note the squadron marking on the rear decking behind the pilot's cockpit. 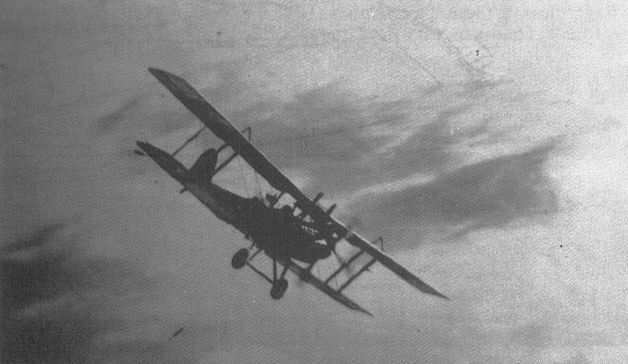 An unidentified B.E.2c, one of many on reconnaissance duties over the trenches of the Western Front. 'A gun is stuck on here and a bomb hung on there . . . '; a B.E.2c loaded with a 112lb bomb (below fuselage) and eight Le Prieur rockets, with obvious detriment to its already poor performance. B.E.2cs at South Carlton in 1917. 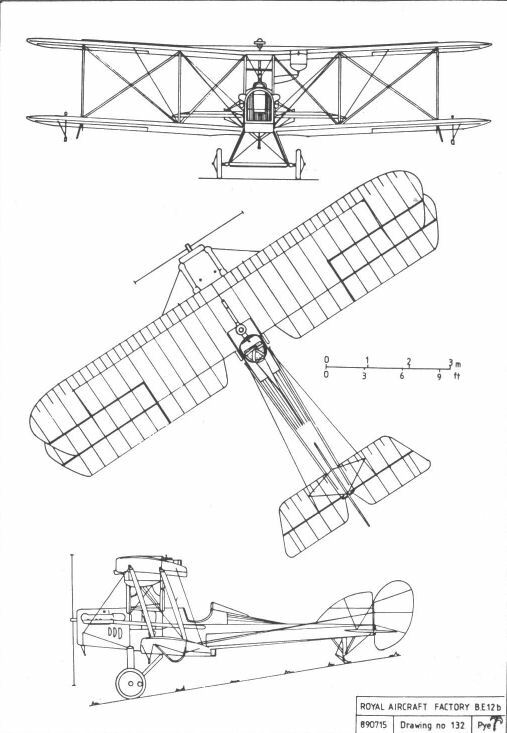 The aircraft nearest to the camera has had its exhausts modified to discharge to the side instead of over the upper wing, as was usual for machines powered by the R.A.F.la. 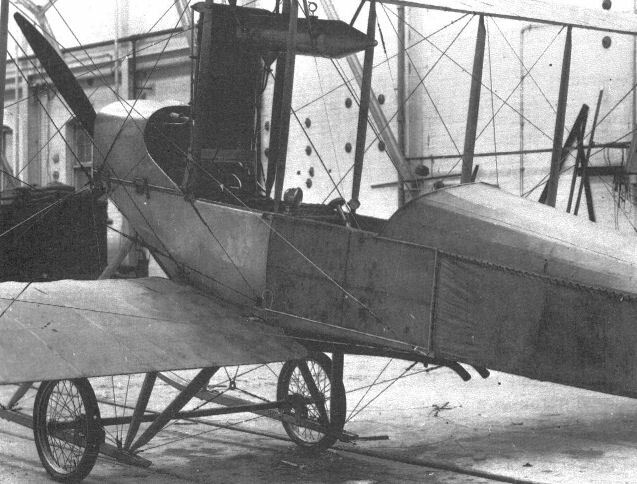 A Bristol-built B.E.2c armoured with over 400lb of steel plate to protect the engine and crew against ground fire. 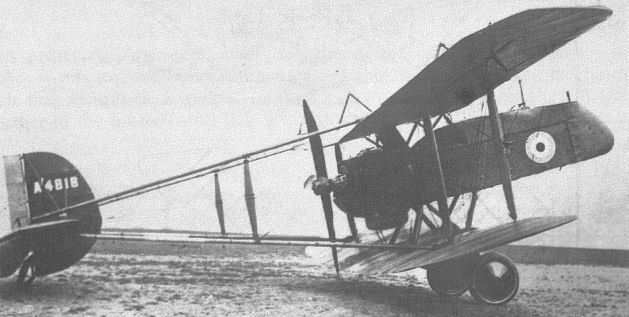 A B.E.2c fitted with a 150hp Hispano-Suiza engine. The identity of the gentleman standing in front of it is now known, but, judging by his worried look, he may have been responsible for this remarkably ugly installation. 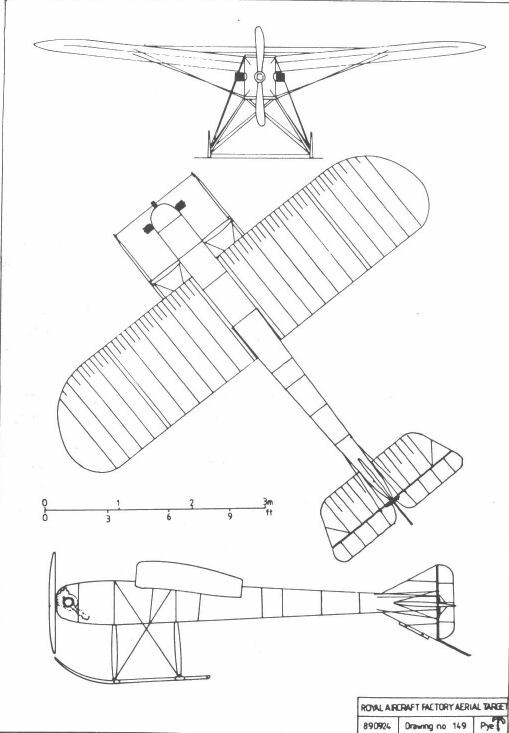 B.E.2d 4451. Note the gravity tank under the upper port wing. 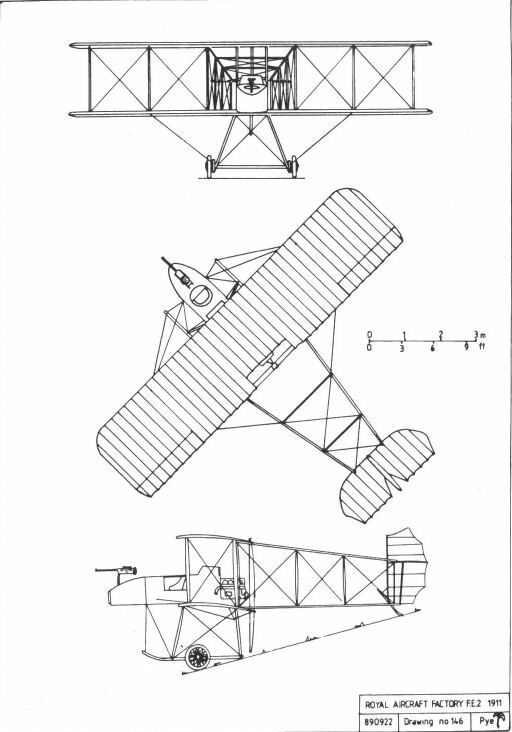 As was common with later examples of the type, this machine has been fitted with the larger, B.E.2e-type fin. 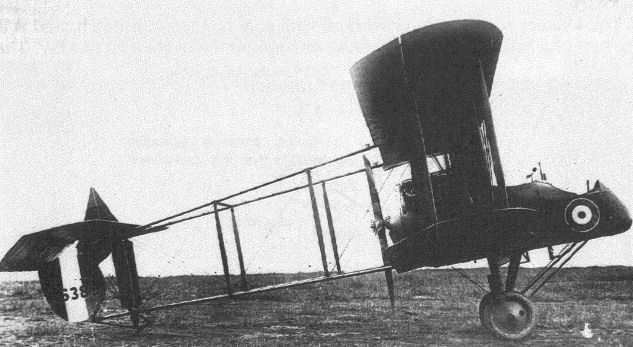 An early B.E.2c in use as an instructional airframe. 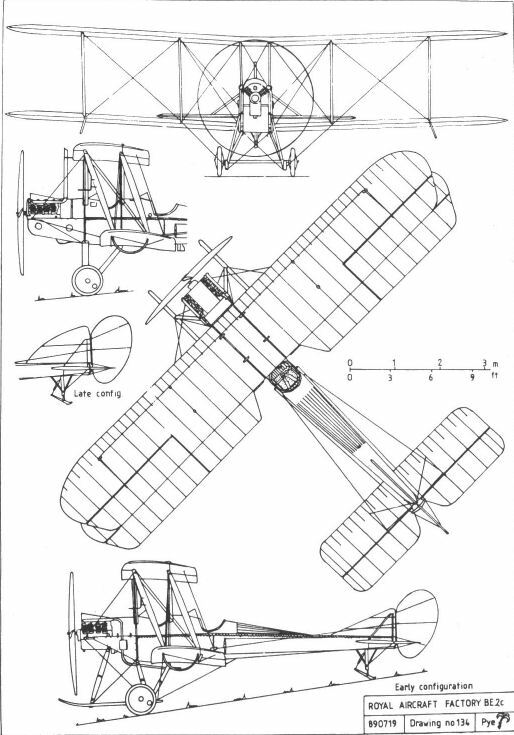 The wing construction is typical of the early R.A.F.6 aerofoil section wings. A Renault-powered B.E.2c fuselage in use as a car for an SS-class airship. Note the flotation bags attached to the undercarriage skids, the additional fuel tank beneath the fuselage, and the air duct to the ballonet. 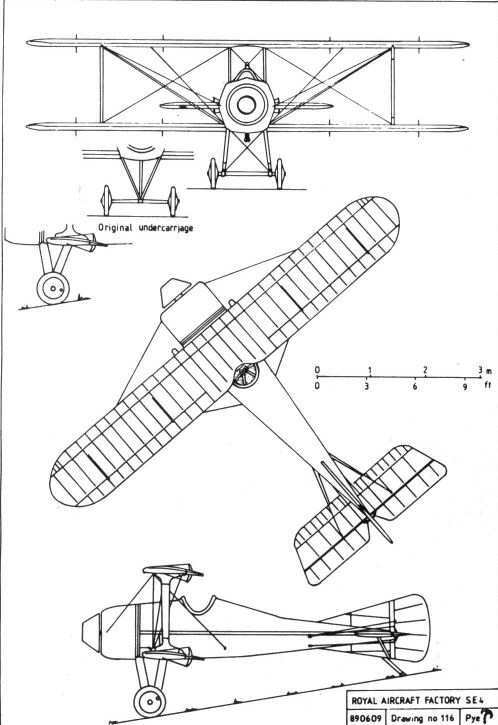 The 'B.E.2xyz' was a heavily modified B.E.2c which took part in a post-war Hendon pageant. 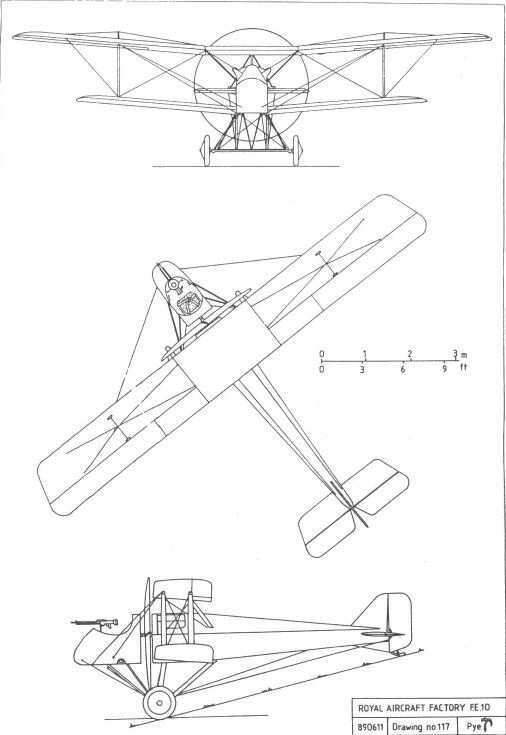 In addition to the extra undercarriage for 'inverted landings', it appears to have been rigged with negative stagger, and was almost certainly not capable of safe flight in this form. 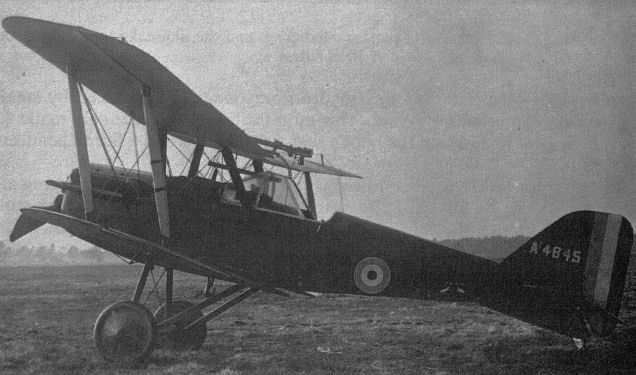 A B.E.2c, showing the seatbelt (there were no shoulder straps) and defensive armament, a Lewis gun on a swivel mounting. The burnt-out remains of the B.E.2c in which Edward Busk perished. 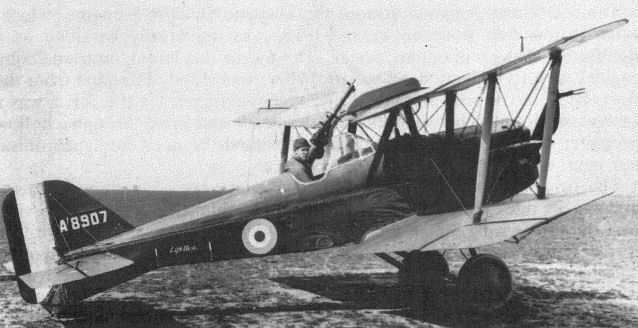 An early R.E.8 with a pillar mounting for the observer's Lewis gun. Later machines were fitted with the Scarff-ring mounting. 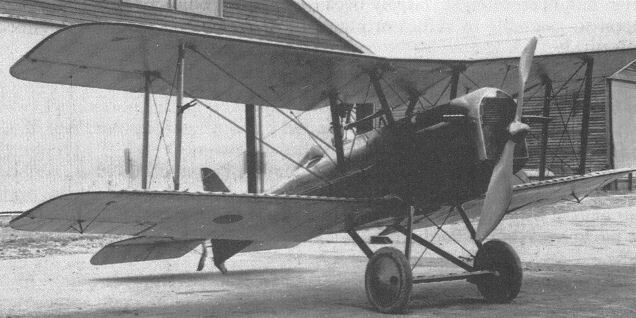 R.E.8 A3433 with 130 h.p. R.A.F. engine, built by the Siddeley Deasy Motor Car Company, with the initial form of fin and the small sump cowling. This machine was still in use at the end of the war, as an artillery observation machine and as a night bomber. 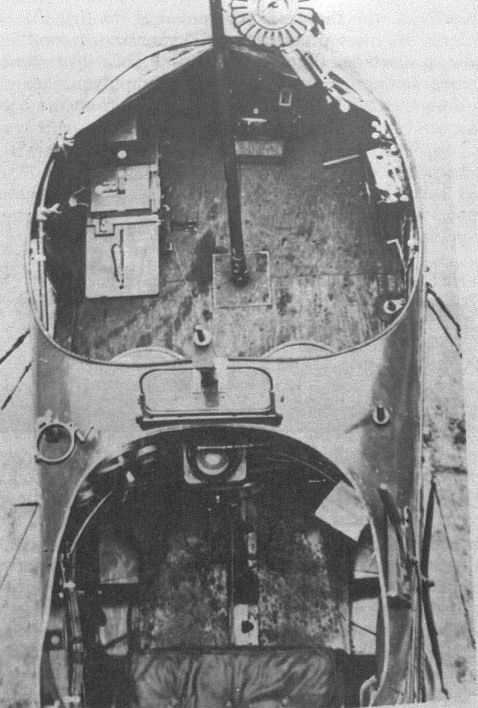 This view of Daimler-built R.E.8 A4224 following a landing accident shows the roominess of the pilot's cockpit. 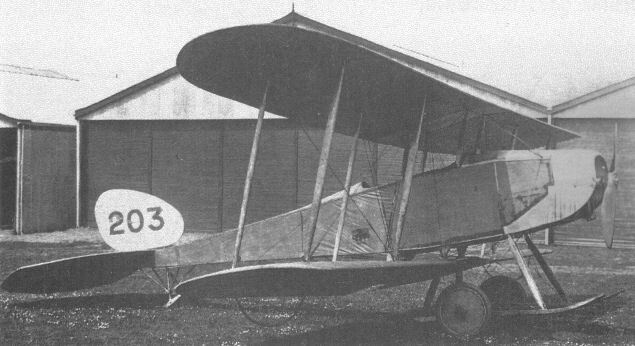 A production R.E.8, built by the Coventry Ordnance Works, with the deeper sump cowling introduced for later machines. A tyro pilot leans proudly against R.E.8 A4737 at Scampton in 1918. This machine has the later sump cowling and the enlarged fin common at training establishments but never used in active service. R.E.8 6557 of 142 Squadron with the slightly enlarged fin adopted for most production aircraft. Note the unfaired steel-tube undercarriage legs. Immaculate Daimler-built R.E.8 C2298. 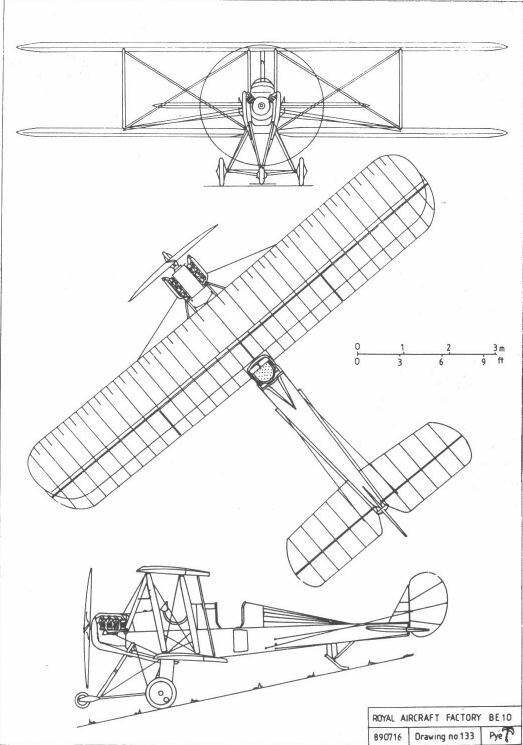 Note the wheel chocks and the screw pickets beneath the wings. R.E.8 F3556 at the Imperial War Museum in London before its transfer to Duxford for restoration and display. 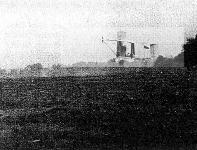 An unidentified R.E.8 taking off from a large, level and luxuriantly grassed field. 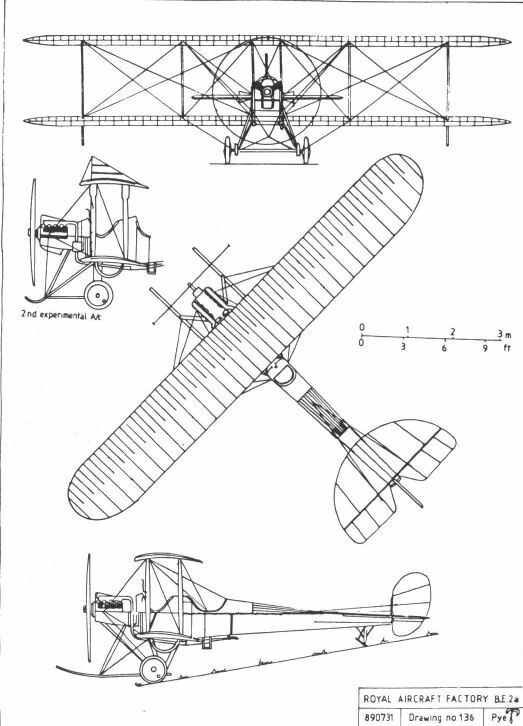 The R.E.8, like its predecessor, the B.E.2, served in every theatre of war. This example is over the desert somewhere in the Middle East. An R.E.8 pilot's 'office', including a Royal Aircraft Factory-pattern compass. Layouts varied slightly between manufacturers, but all machines were similarly equipped. 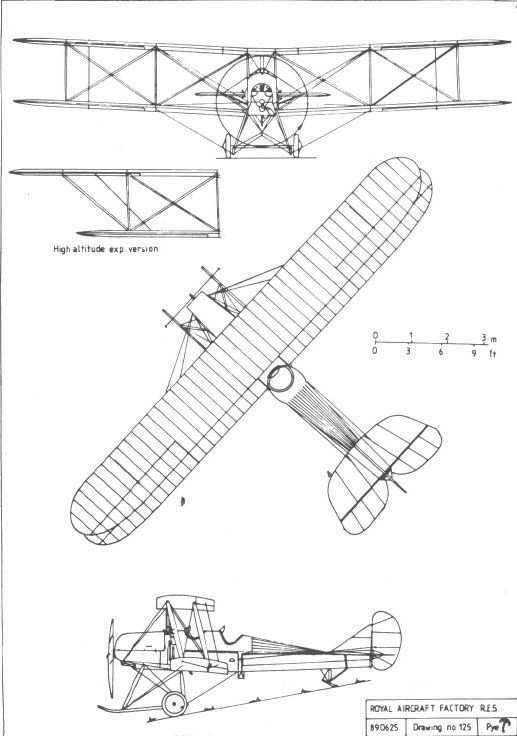 The remarkably clean, almost visionary Royal Aircraft Factory BS I was another creation of designer/pilot Geoffrey de Havilland and made its debut in early 1913. 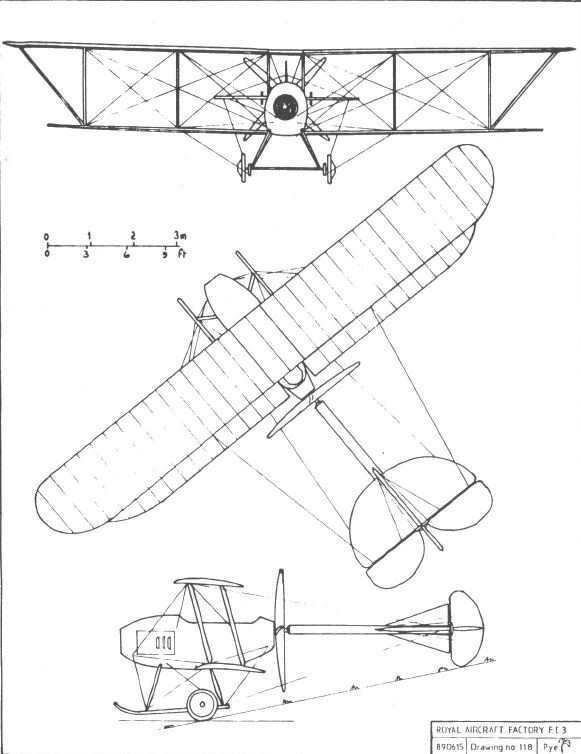 Extolled by the noted early military aviation historian, J.M.Bruce, as being the sire of all future single seat fighters of World War I, the BS I had what can only be described as a vivid performance, for its day, being capable of 92mph, coupled to a 900 feet per minute initial rate of climb. All this on the power of an 80hp Gnome! In its earliest form, seen here, the BS I's rudder, unaided by any fin, was simply inadequate to provide effective directional control and anyway was too weak, as it demonstrated by breaking away on 27 March 1913, breaking de Havilland's jaw in the ensuing crash. 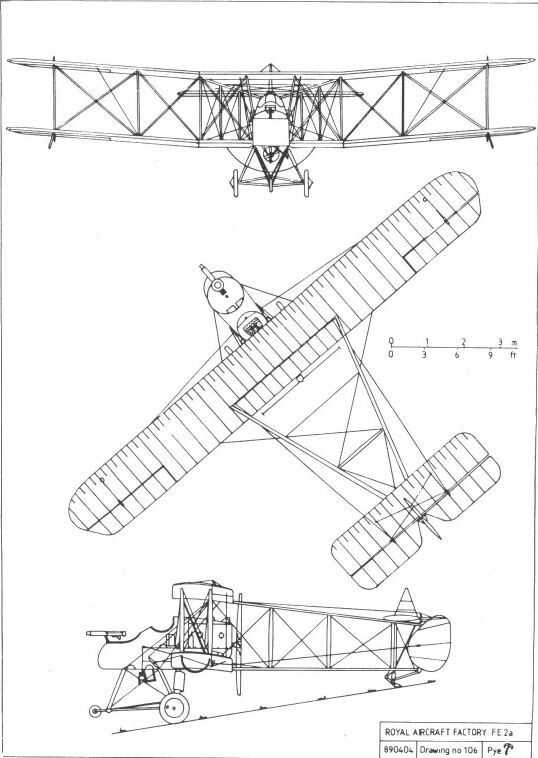 Rebuilt with a more effective tail unit, the aircraft became the SE 2. The very advanced B.S.I ouside the Factory compound, with the new airship sheds, a spherical balloon, and the airship Gamma II in the background. The colossal Handley Page V/1500 bomber. 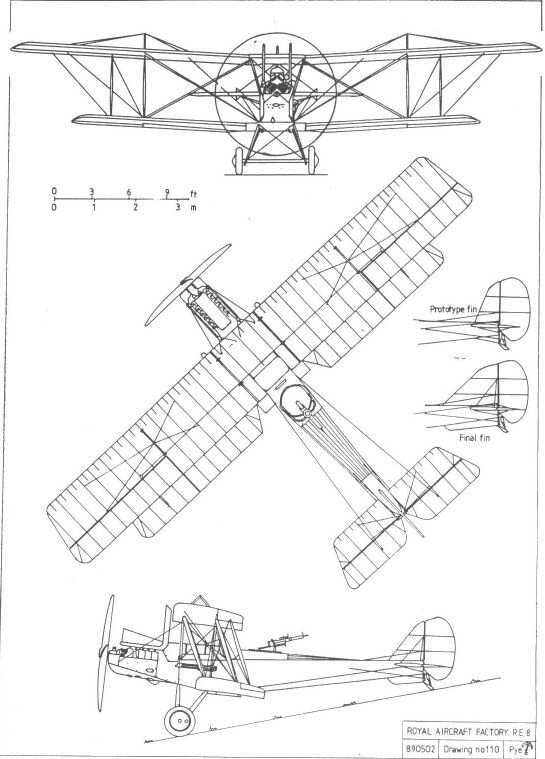 Royal Aircraft Factory research established that the rear propellers in such tandem engine arrangements could never achieve more than ninety per cent of their usual efficiency owing to interference from the slipstream of the tractor propellers. RAF BE.8 developed from the BE.3/4. 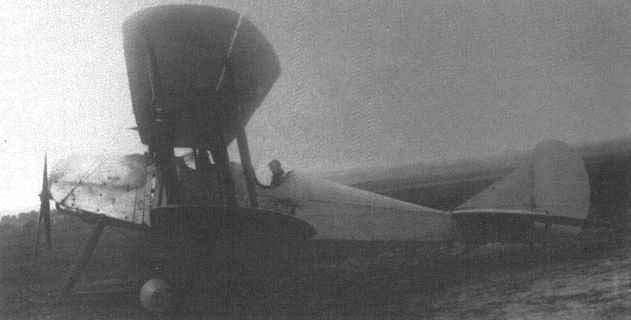 The prototype originally had an undivided cockpit and no fin. 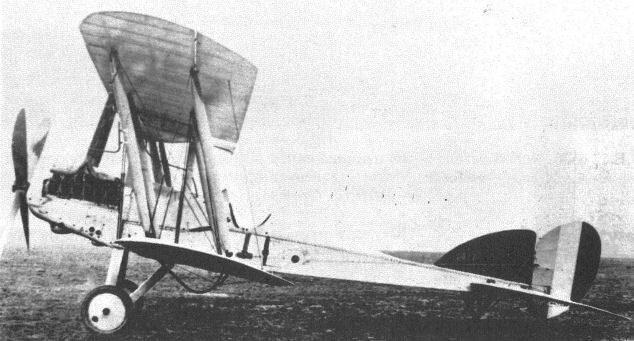 Another view of the prototype B.E.8. 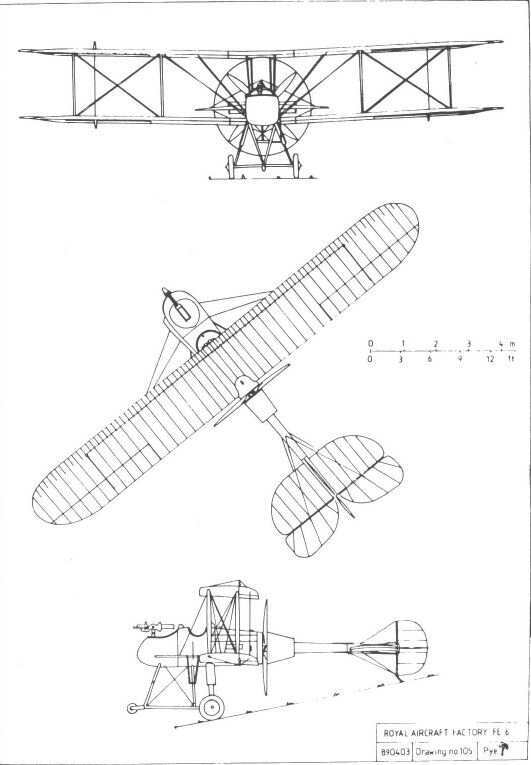 The family resemblance to the B.E.2 is obvious. BE8a '2134 seen at Farnborough. 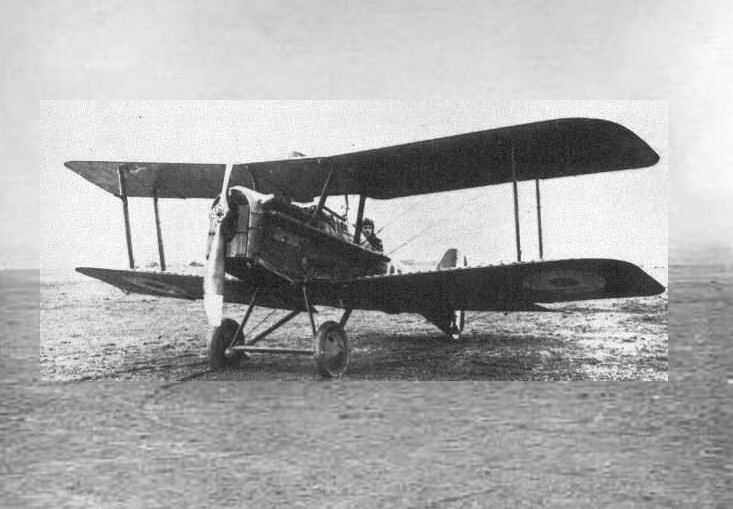 This was a Vickers-built aircraft and after a short period with the Wireless Trials Unit it was allocated to 9 Squadron, which undertook much of this development work. The use of wireless telegraphy was seen as essential, especially for the co-ordination of artillery shoots. The BE8a was often referred to as the Bloater' and it saw little operational service. 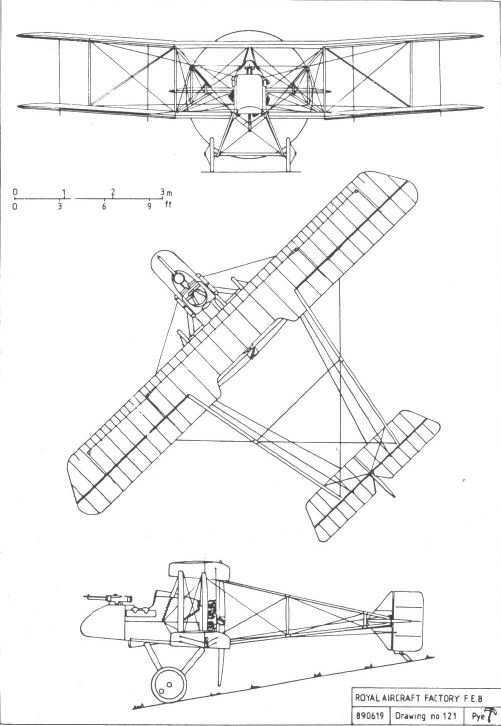 The anachronistic Royal Aircraft Factory FE 9 two-seat reconnaissance fighter was powered by a pusher-mounted 200hp Hispano-Suiza and first flew in the early spring of 1917. As the Bristol F2B was already more than adequately meeting this requirement, it was not surprising that this design with its top level speed of 105mph at sea level, plus faltering climb that took 8 minutes 25 seconds to reach 5.000 feet was abandoned. 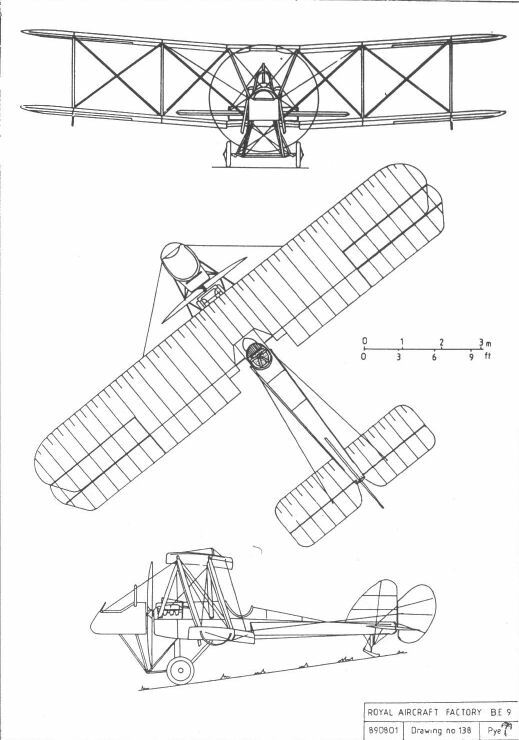 The only machines to fly were the three development aircraft, the first of which, Serial no A 4818, is seen here. 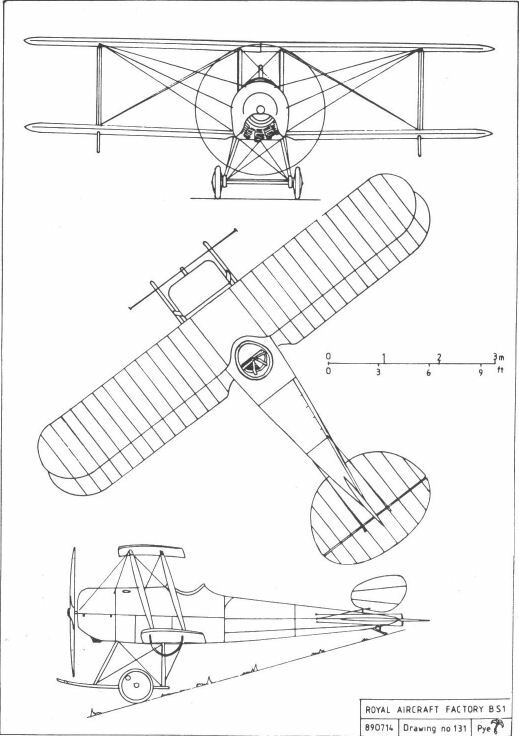 A standard R.E.5, powered by a 120hp Austro-Daimler engine driving a four-blade propeller, and with wings of equal span. 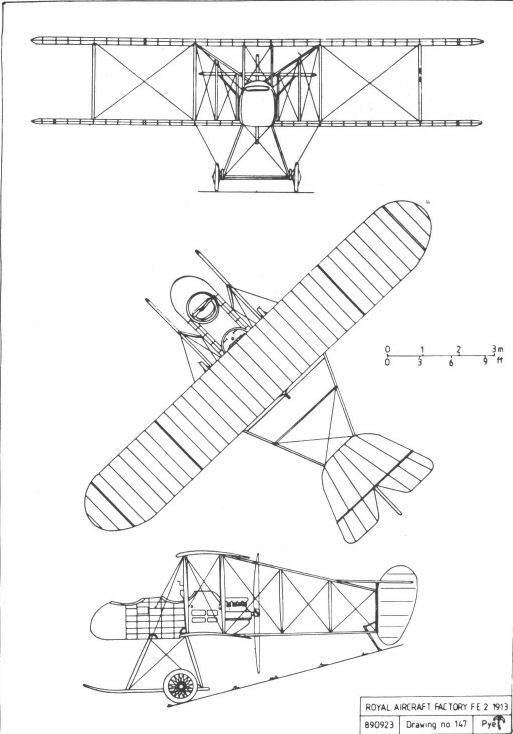 Twenty-four of them were built in 1914-1915 with short or long span wings. An unidentified R.E.5 at Farnborough on 17 July 1914. 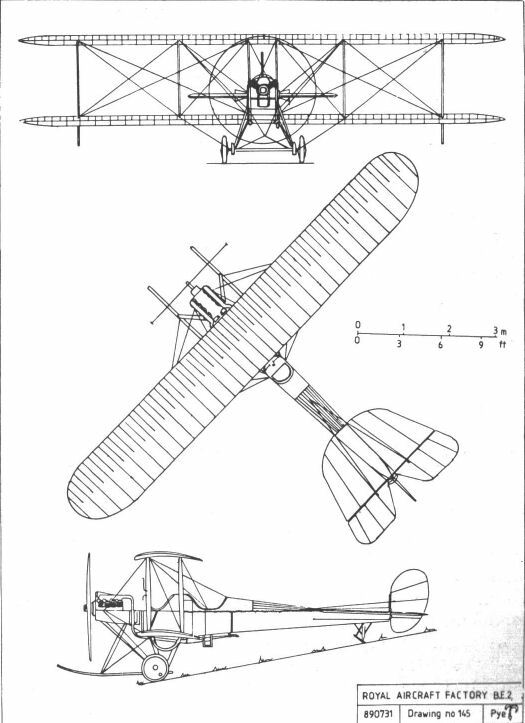 An R.E.5 with the long-span upper wing. One of the officers by the wingtip appears, from his uniform, to be French. 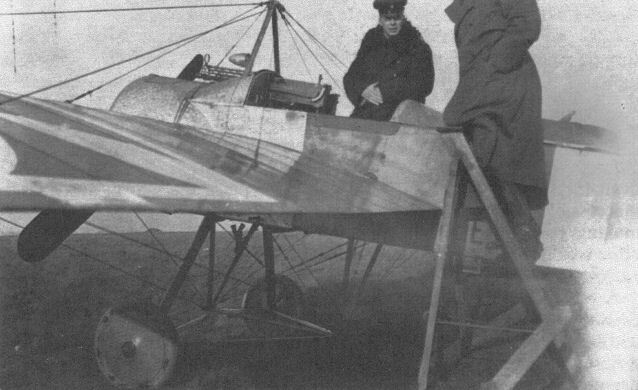 Norman Spratt about to take off in an R.E.5 to break the altitude record, 16 January 1914. A replica of the S.E.4's original cockpit canopy, which was never actually used in flight. A poor but unique photograph of S.E.4a 5610. This sketch in H P Folland's notebook, dated 28 December 1914, depicts an armoured scout based on the S.E.4a. 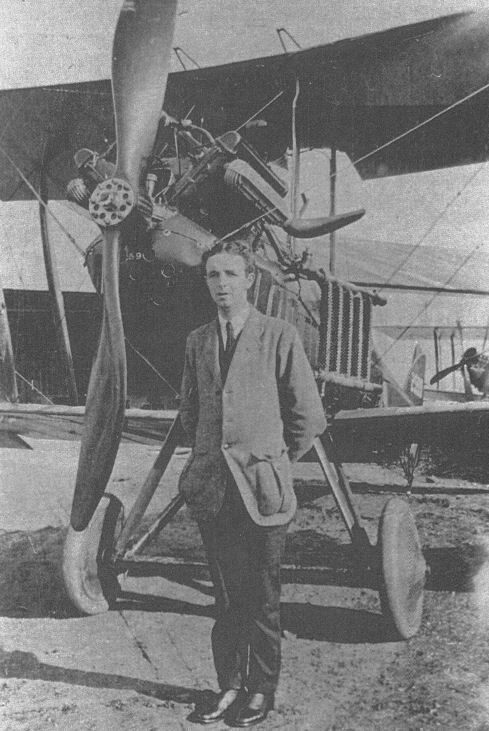 The famous pioneer pilot Claude Grahame-White in a Farman pusher of the type which gave O'Gorman the designation 'F' Class for pusher designs. 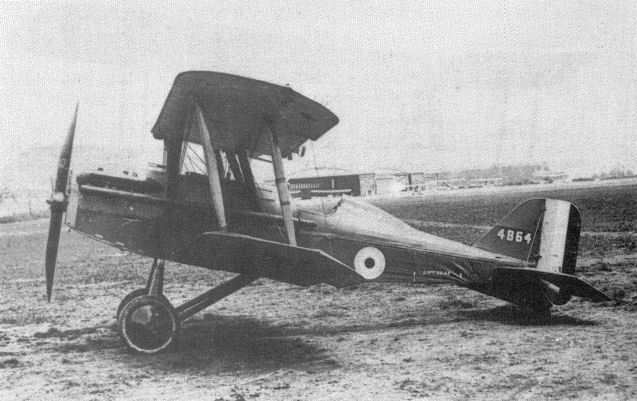 RNAS B.E.2e 6326 with a neatly-cowled Curtiss OX-5 engine and a car-type frontal radiator. 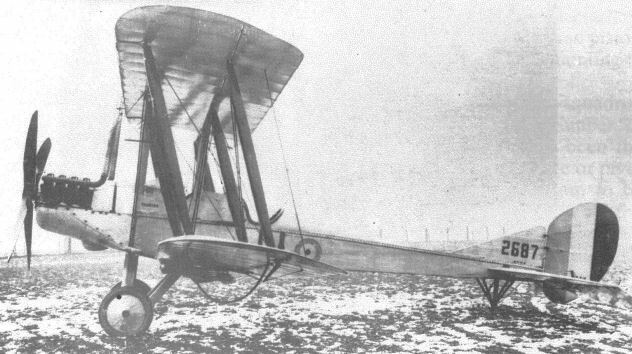 This unidentified B.E.2e (or g), forced down by a blizzard near Wragby in Lincolnshire, clearly shows the long upper-wing extensions which distinguished the type and which gave rise to initial concern regarding their strength. 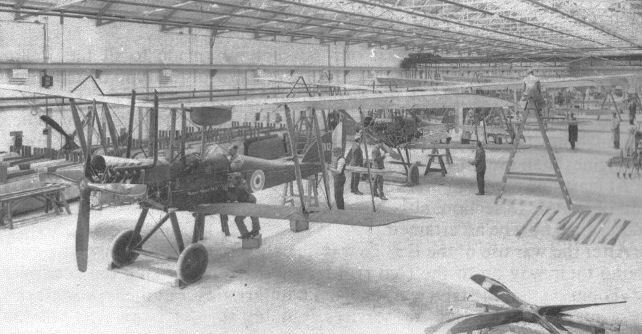 B.E.2gs under construction at Wolseley Motors. The nearest aircraft is A3113, a presentation machine bearing the legend Orissa States No3. 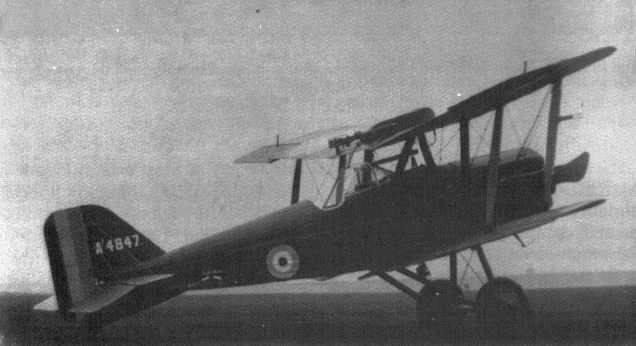 B.E.2e A3117 with a camera fitted beside the pilot's cockpit. The type's inherent stability must have been an asset when plates had to be changed while trying to hold the machine in straight and level flight. 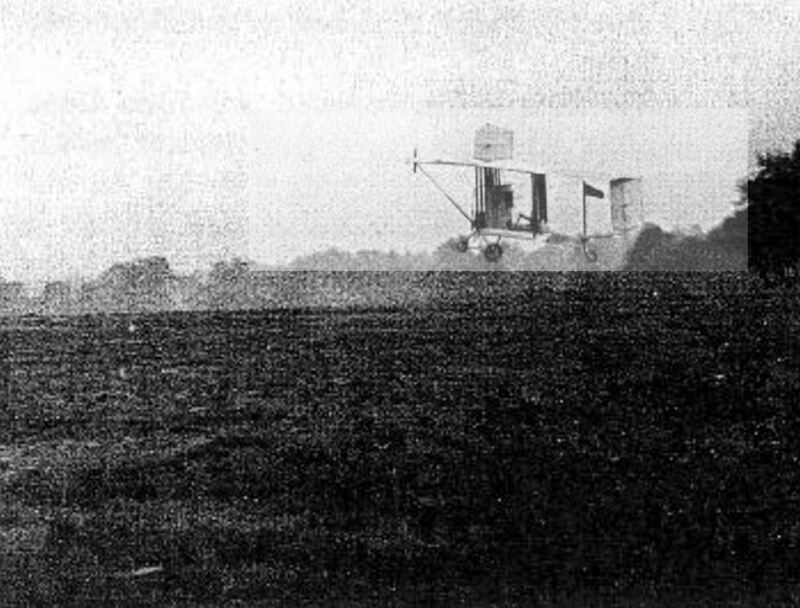 Samuel Cody makes the first powered, sustained and controlled flight in Great Britain, in British Army Aeroplane No I, on October 1908. British Army Aeroplane No 1 emerges from the Airship Shed on 20 January 1909, after rebuilding. The streamers are to show the path of the airflow over the machine. Note the folding tailbooms, designed to facilitate storage. 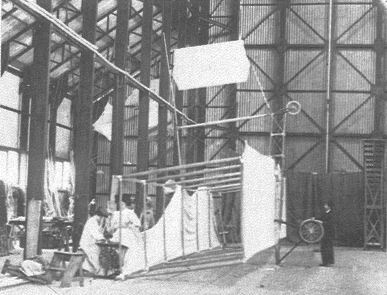 Sewing the fabric covering on to the mainplanes of British Army Aeroplane No 1 inside the original airship shed, with S F Cody keeping a watchful eye on the workmanship. 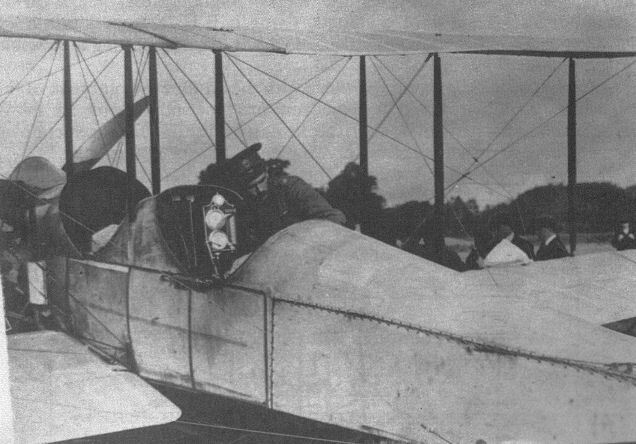 S F Cody at the controls of British Army Aeroplane No 1. The photograph was taken in September or early October 1908, and was almost certainly posed for the benefit of the press, as one wheel is still without a tyre. Note the crossed chain drive to the propeller on the port side. 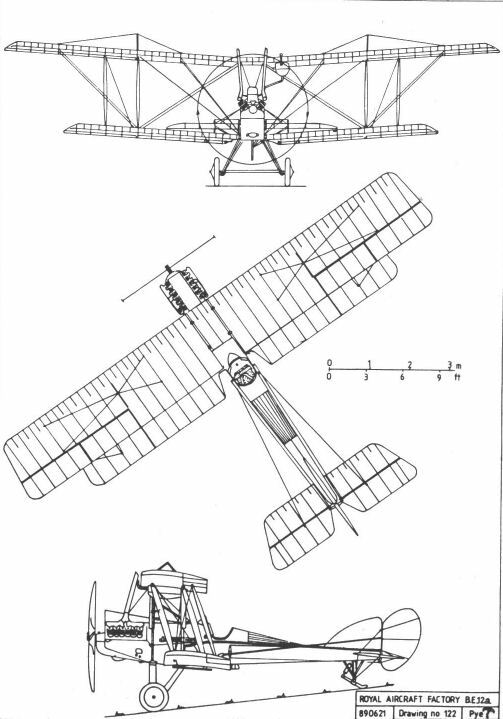 De Havilland No.2 was flown in 1910 and was purchased by the War Office and used for development work at Farnborough identified as FE 1. O'Gorman designated all tractor machines 'B' Class after Bleriot's famous cross-channel machines, which remained in production until about 1915. The B.E.I, apparently complete, inside the Factory workshops on 1 October 1911. Its first flight was not made until 4 December. 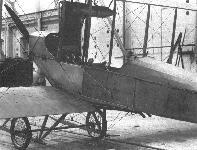 The B.E.1 after the installation of a Renault engine in place of its original Wolseley. 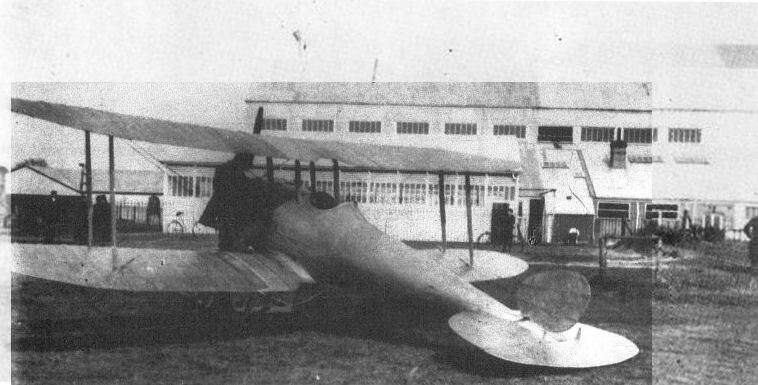 The aeroplane nearest to the camera is almost certainly 201, the B.E.I , seen here late in its life, by which time it had acquired a B.E.2b-type fuselage. The B.E.3 with Geoffrey de Havilland in the cockpit. The B.E.3 after hand-over to the RFC, most probably at Hendon in September 1913. B.E.3 number 203 with four-bladed propeller, date and location unknown. A B.E.4 on Farnborough Common with the Factory buildings, including the newly extended airship shed, in the background. 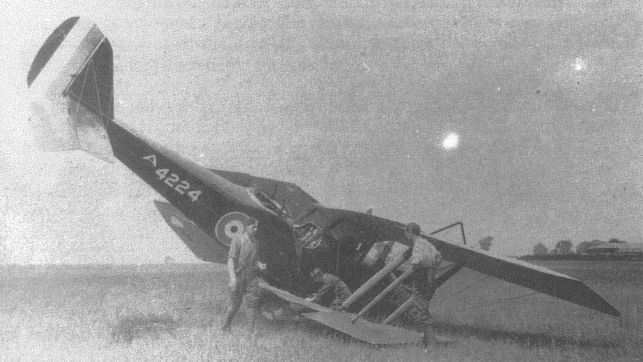 A B.E.4 prepares to take off, observed by a group of senior officers, one of whom appears to be HM King George V.
Ill-fated B.E.4 204, which crashed, killing its crew, on Farnborough Common, together with other RFC machines including a Breguet and several Farmans. 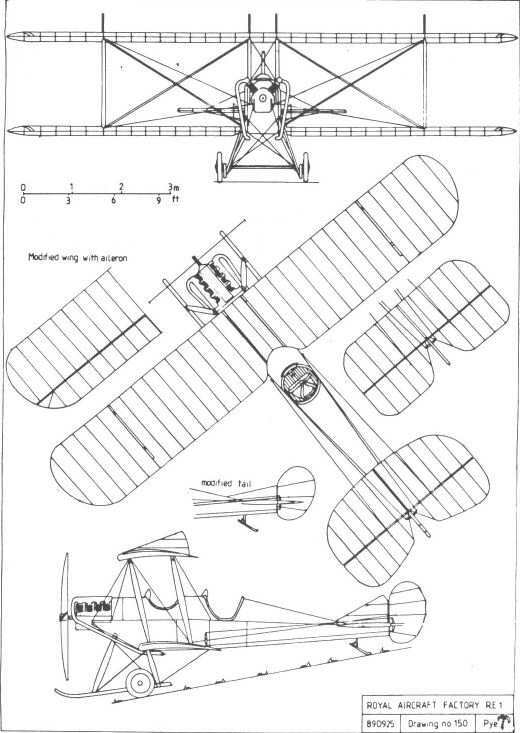 Santos-Dumont made the first powered flights in Europe in his 14bis canard boxkite biplane in October 1906, but it was dead-end design and its 'flights' were nothing more than brief hop-flights that paled into insignificance when compared with the extended, fully controlled flights already achieved by the Wrights. The first R.E. 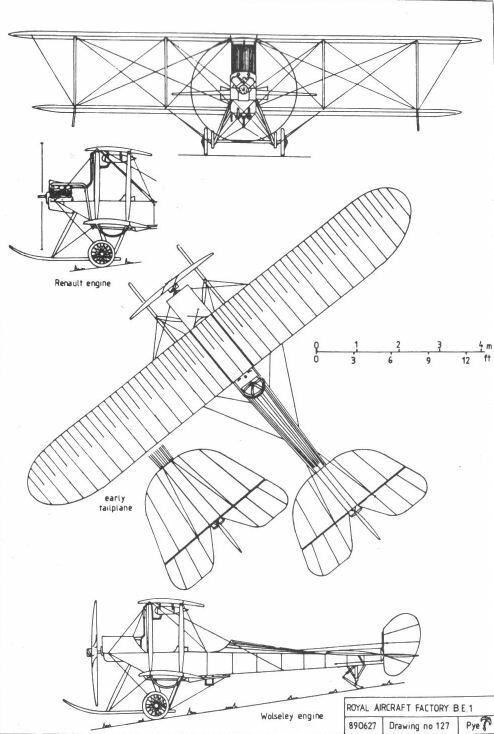 1 following its modification to include ailerons. 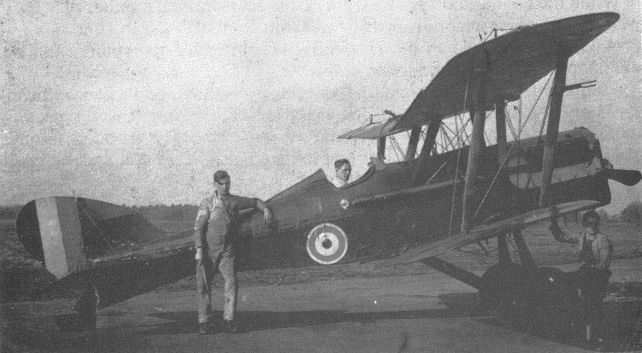 R.E.I 608 with new wings, incorporating ailerons, photographed on Jersey Brow in company with a Sopwith three-seater and a Farman. The R.E. 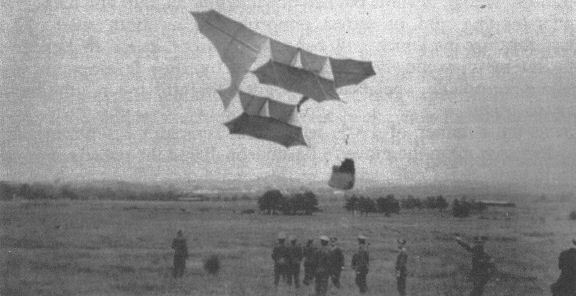 1 in flight, with short-span warping wings. 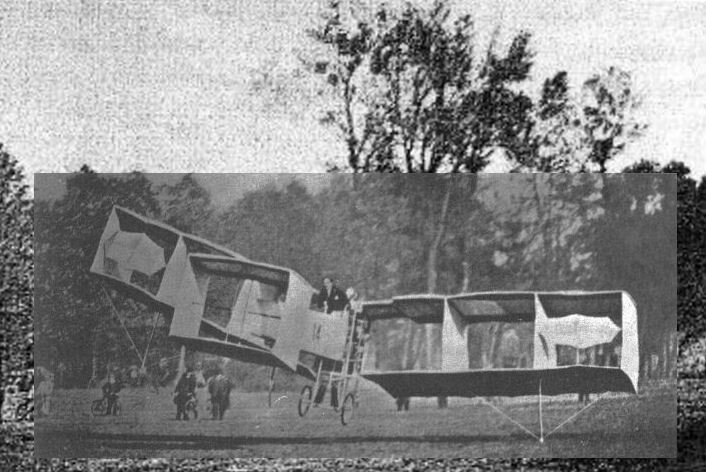 E T Busk seated in his first stable aeroplane, the R.E.I, seen here with experimental fin surfaces above the upper wing. The R.E.I fuselage before covering. The Aerial Target. Note the aerial wires running vertically down the rear fuselage and chordwise on the wings. S F Cody, assisted by his sons (also wearing sombreros), launches a string of man-lifting kites some time before their adoption by the Army. 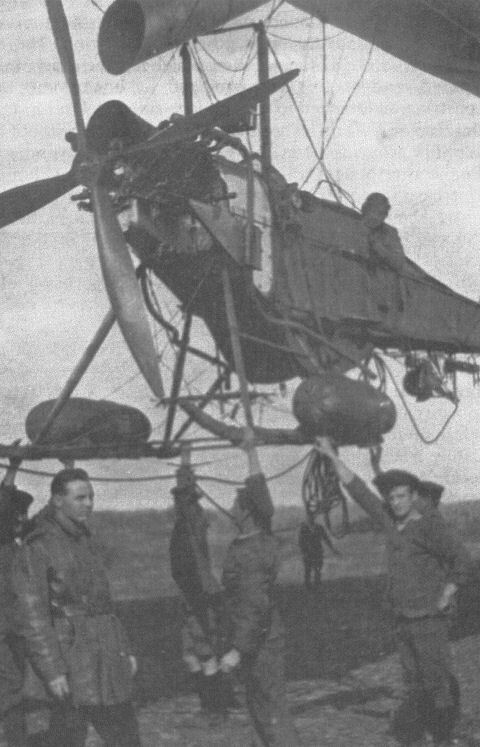 S F Cody (in sombrero) and men of the Royal Engineers launch a man-lifting kite. S F Cody's victorious Military Trials machine outside his shed on Laffan's Plain. 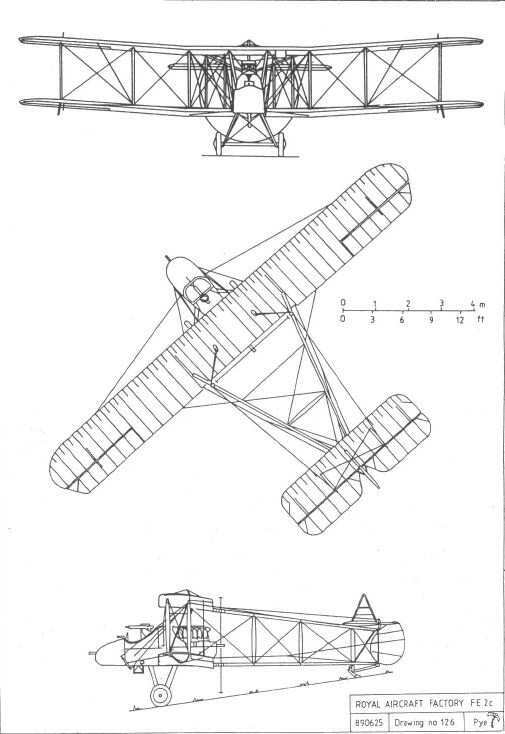 The greater modernity of contemporary Farnborough designs such as the B.E.2 is all too obvious. 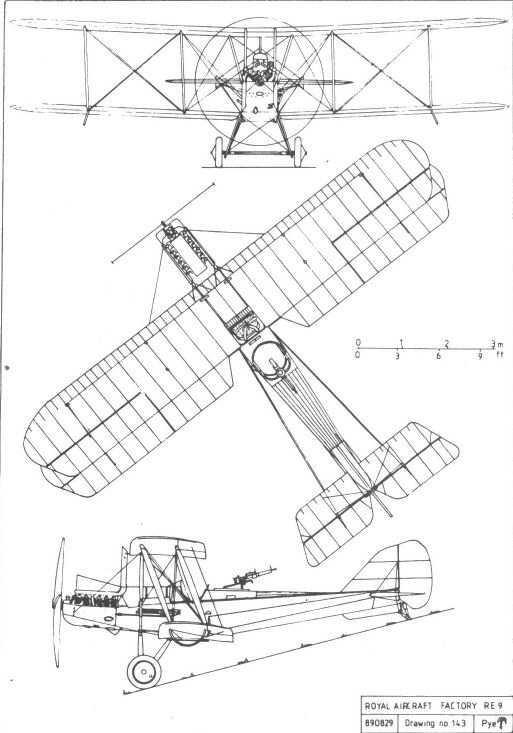 The 1911 version of the F.E.2, fitted with a Maxim-type machine gun. 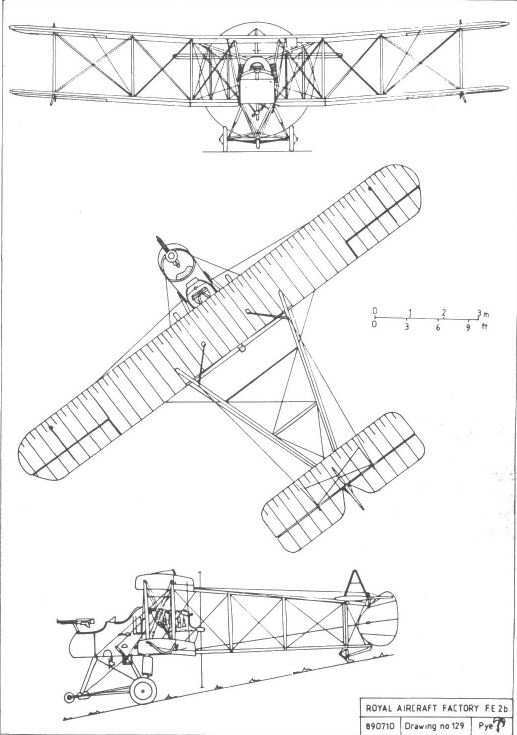 The 1911 F.E.2 on floats was tested on Fleet Pond with a 70hp Gnome engine. The age of the spectators suggests that they are not Factory employees. 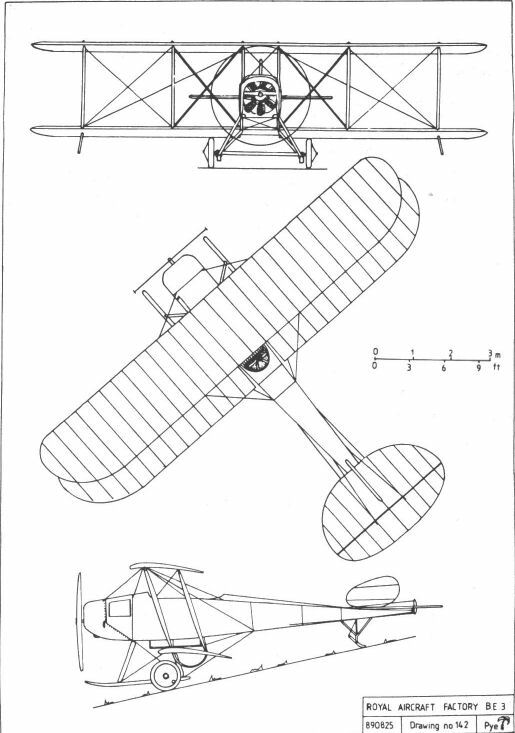 RAF FE.2 the 1913 version had a 70 h.p. Renault engine and new wings among other changes. 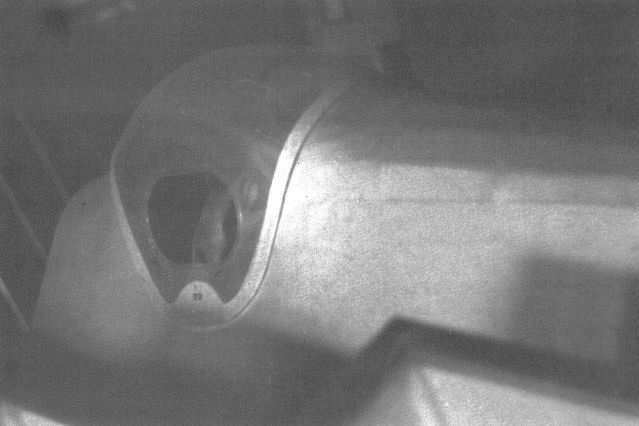 The nacelle of the 1913 F.E.2 under construction, with the 70hp Renault engine already installed. The H.R.E.2 with a 100hp Renault engine undergoes flotation trials on Fleet Pond. It was unable to take off and reverted to a modified form of the land version for the RNAS. The R.E.3 at Farnborough. 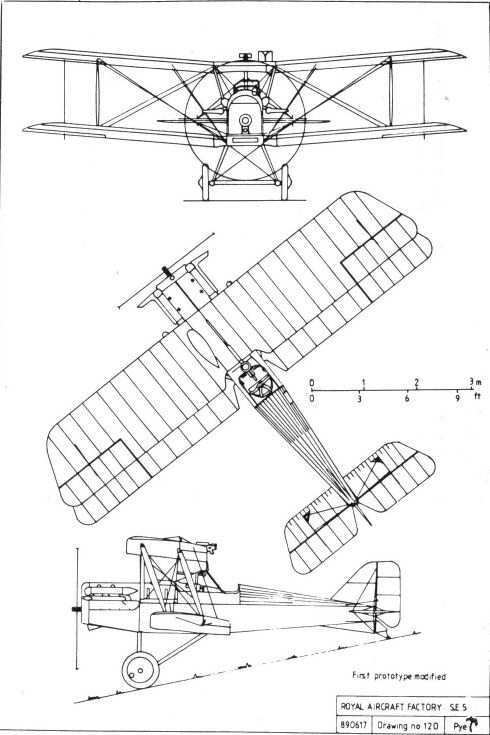 This was the same as the RE.2 in its final form but had an Austro-Daimler engine. 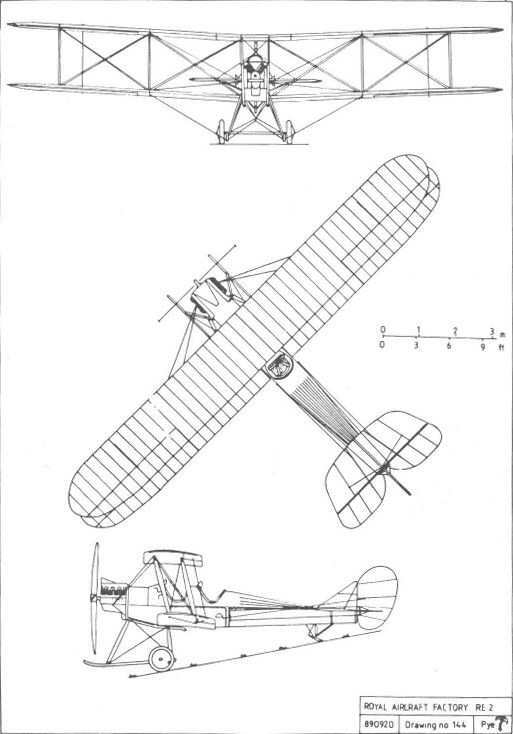 The R.E.3, showing the deep cowling needed to enclose its 120hp Austro-Daimler engine. This view of the B.E.9 clearly illustrates the reason for the observer's sense of isolation. 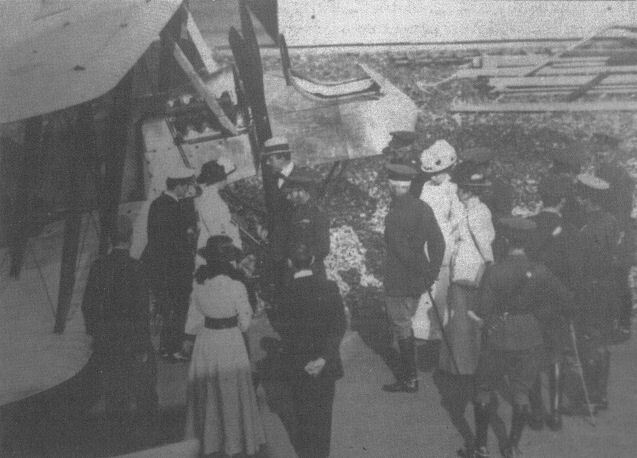 The B.E.9 is shown to HM King George V during his visit to Farnborough on 18 August 1915. The C.E.I N97 afloat at Hamble. The C.E.I N97 on its beaching trolley at the Isle of Grain. 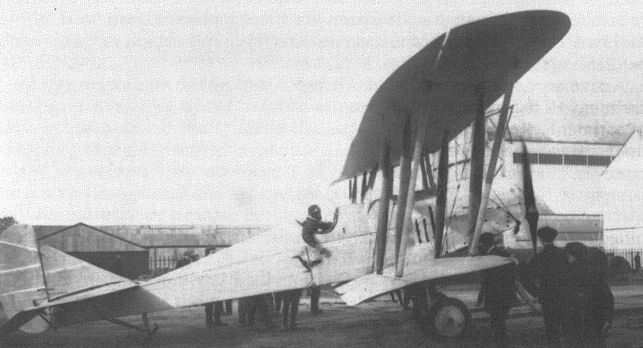 A front view of C.E.I N97, showing the bomb racks under its lower wings and the small sections of the upper wing trailing edge which hinged upwards to allow the wings to fold. 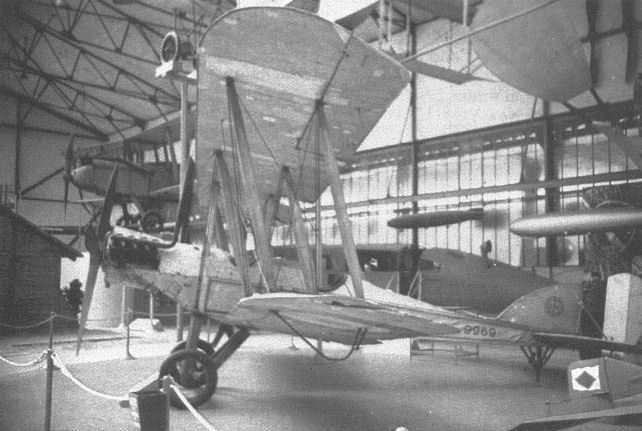 The C.E.I N97 with its wings folded for storage. This superb model of the C.E.I, which is housed in the RAE's private museum, clearly shows the forest of booms, struts, and wires which handicapped the performance of such pusher designs. A view of the western end of what had by then become the RAE, taken from Jersey Brow during 1919. The aeroplane is the unsuccessful Tarrant Tabor, the testing of which was to have been supervised by the RAE staff. Unfortunately the huge machine crashed on its initial take-off attempt, and the project was abandoned. 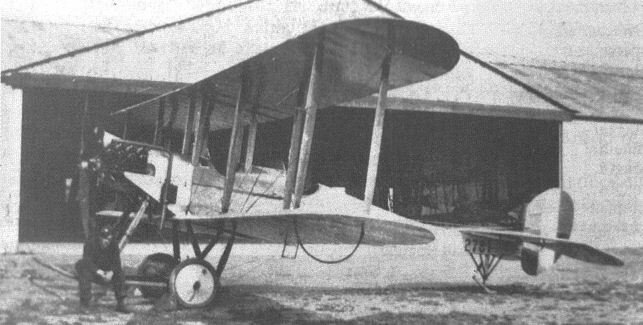 The first F.E.4, with R.A.F.5 engines. Note the small tractor propellers and huge air scoops essential to assist engine cooling. 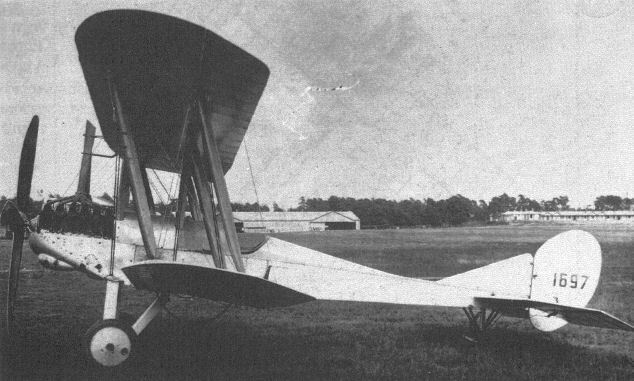 The first prototype F.E.4, 7993, in P.C.10 finish at the Central Flying School for service trials.